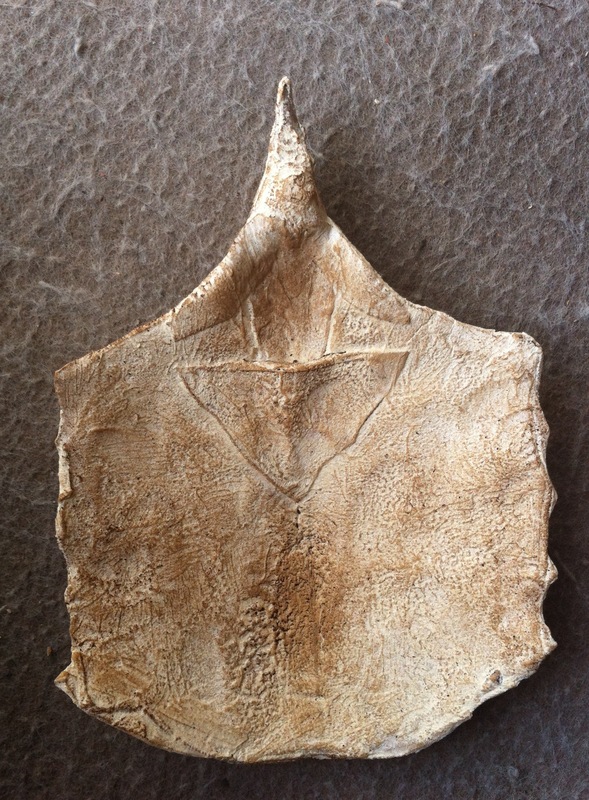 Tupuxuara’s chest is protected by a big solid flat bone called the sternum, or stern. 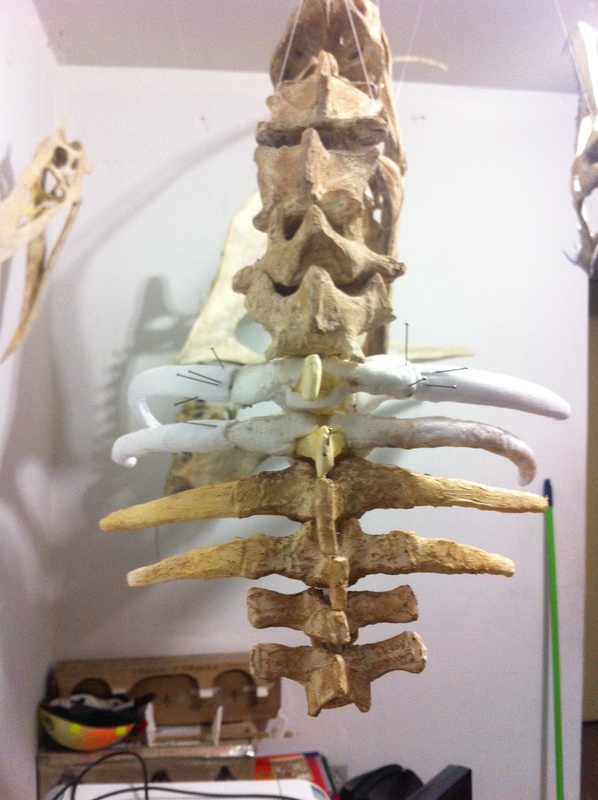 The stern will connect to the vertebrae through the scapula-coracoid bone and the ribs. Since it is practically flat, I started out drawing one of the sides on a 5mm sheet of XPS foam. It is flat, but slightly rounded. 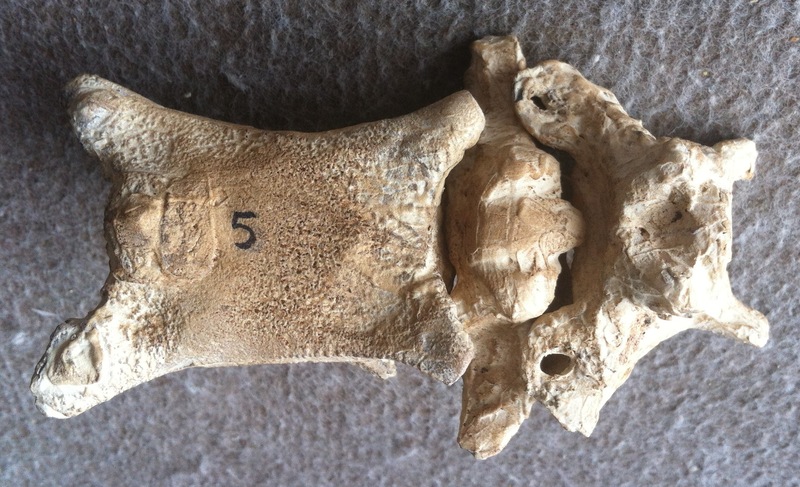 It has a deep cavity on the inside near the front, and the tip is slightly rounded. 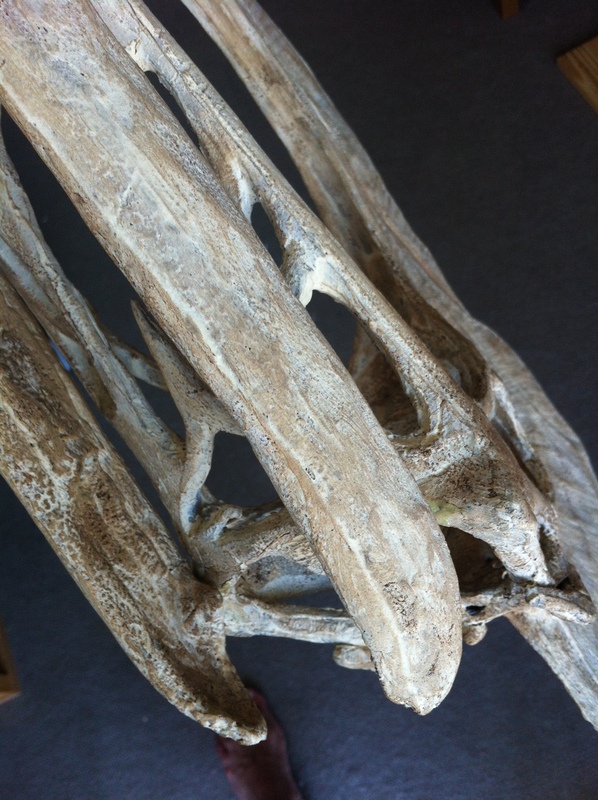 I had to infer all this from the shadows of the fossil, since I only have a photo of each side. There are no side, front or back views. 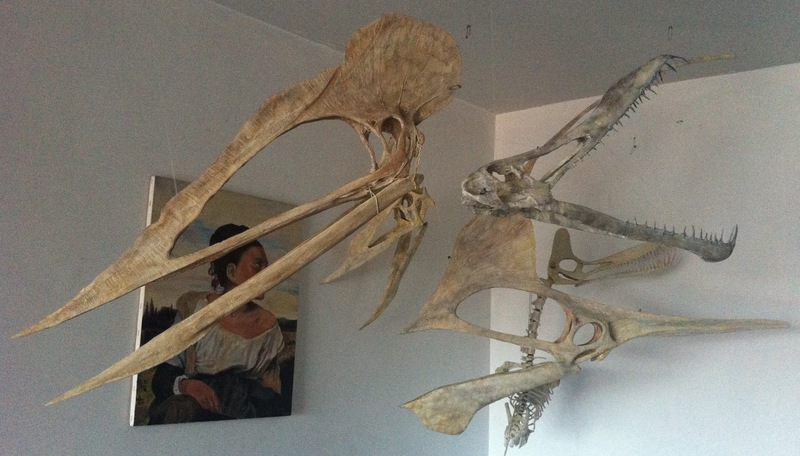 But I looked at some models and other pterosaurs and I think it’s a reasonable stern. 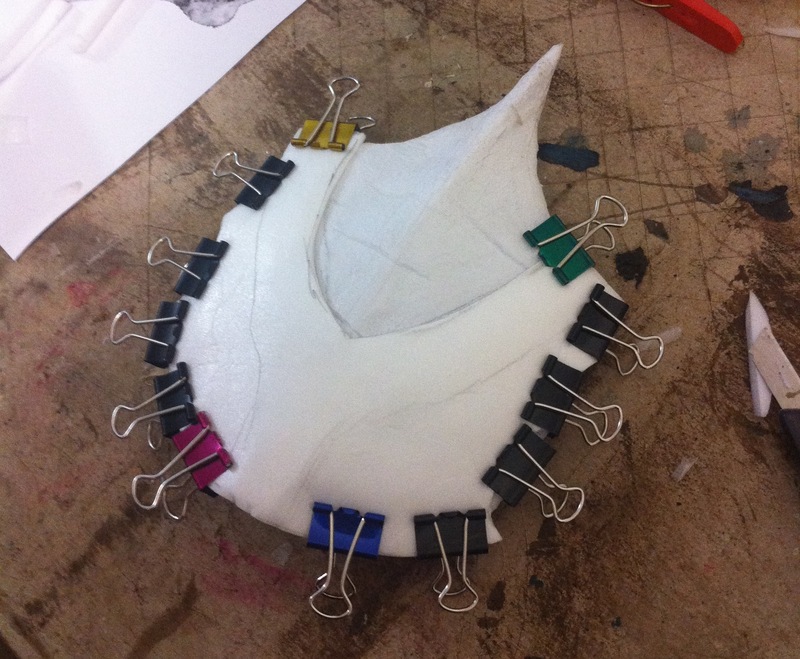 So I twisted and folded the foam into shape, and glued some layers to keep everything in place. When dry, I used a lighter to burn the foam a bit, add texture and smooth the edges. I think I did it too much, since the stern is slightly smaller than it should be. But I can fix that later. This is a view of the inside. And this is a view from the outside of the stern. I finished it with a layer of acrylic resin (modelling paste), some sandpaper and later, when dry, stained with coffee. Here is the result. Those are the views I can compare to the pictures of the fossil. These are the views I did not have of the fossil, so I had to infer. 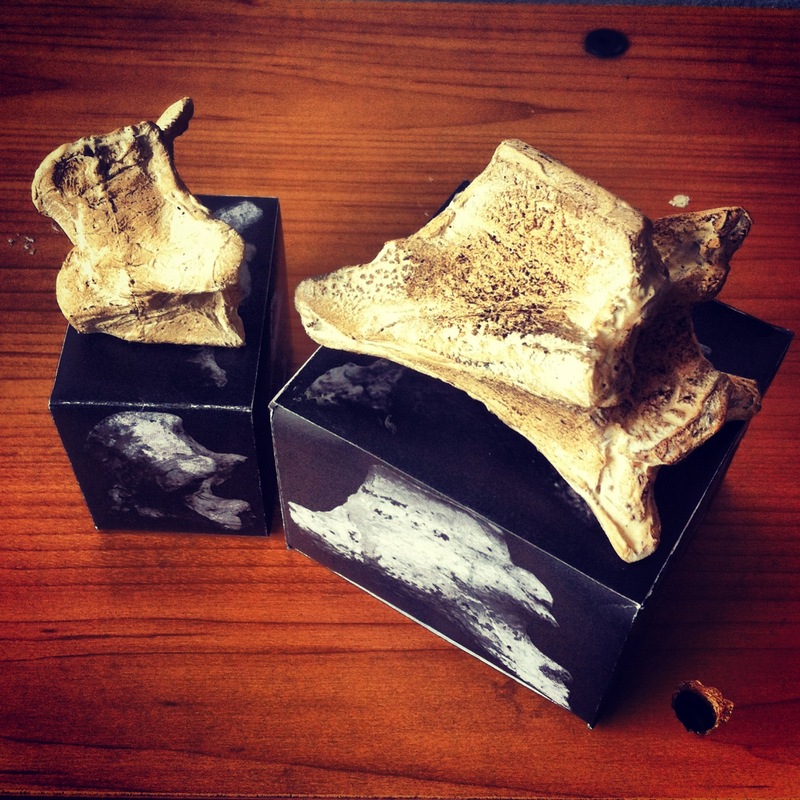 I hope they are not too different from the real bone. As usual, I can always change something. 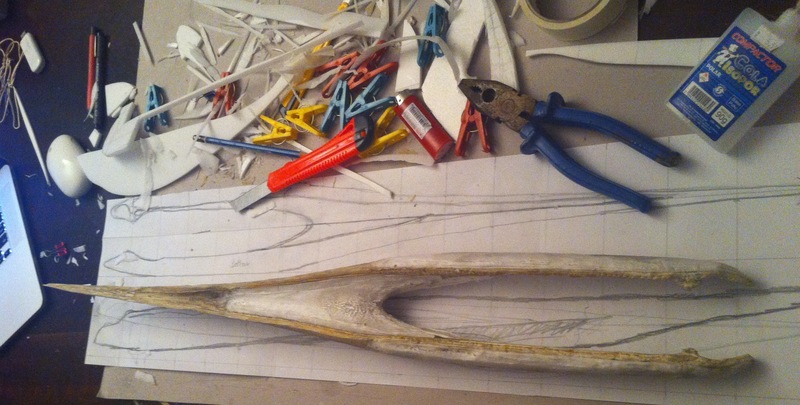 I probably will review all these bones when I connect them. 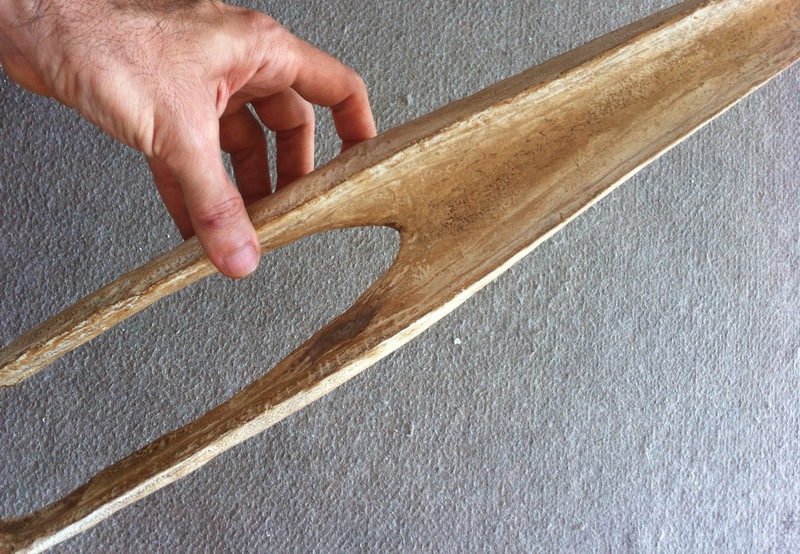 The stern will connect to the coracoid and ribs, so I might change something when I test the connections. 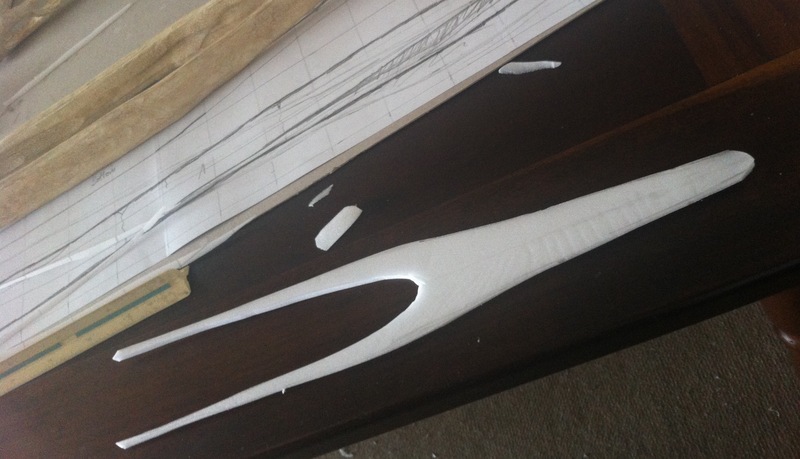 I decided to carve the two shorter cervicals from a solid block of foam. 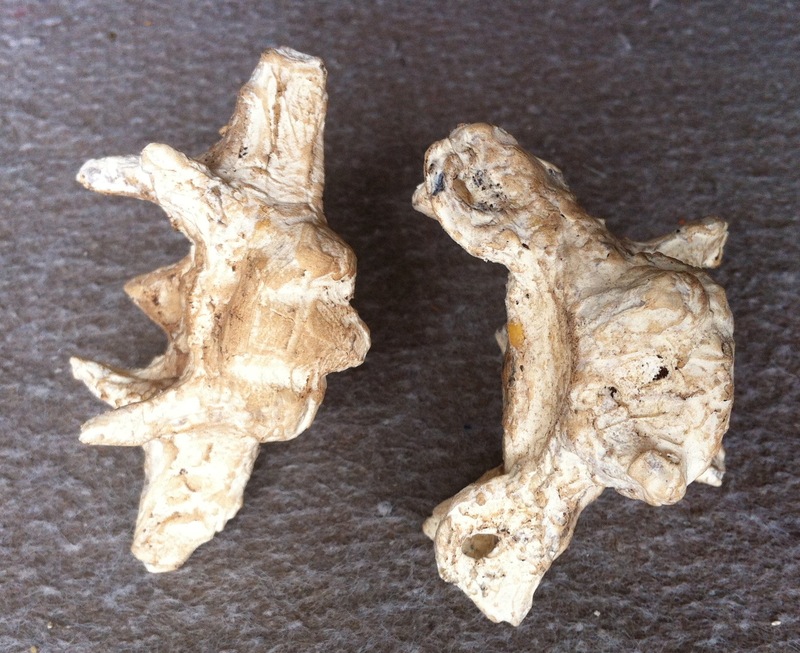 These are the last two cervicals. 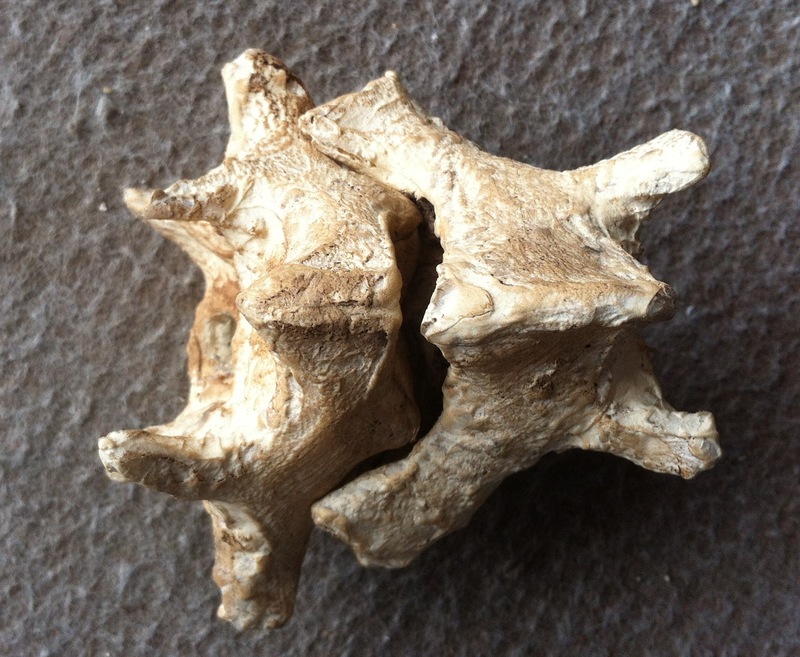 The ones which connect to the thoracic vertebrae (notarium). I tried to make one of them hollow but it got too complicated, so I gave up and cut out a block of XPS foam for each one. 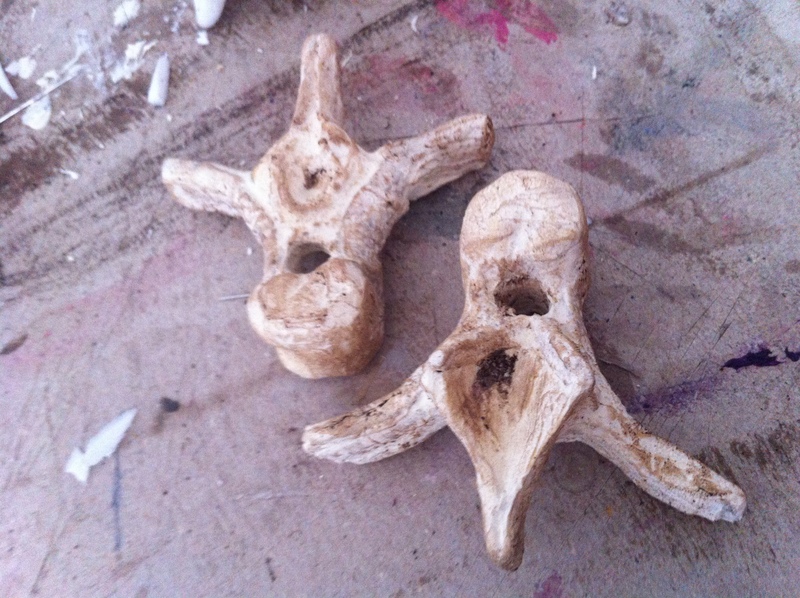 And then I carved them in the shape of the vertebrae. 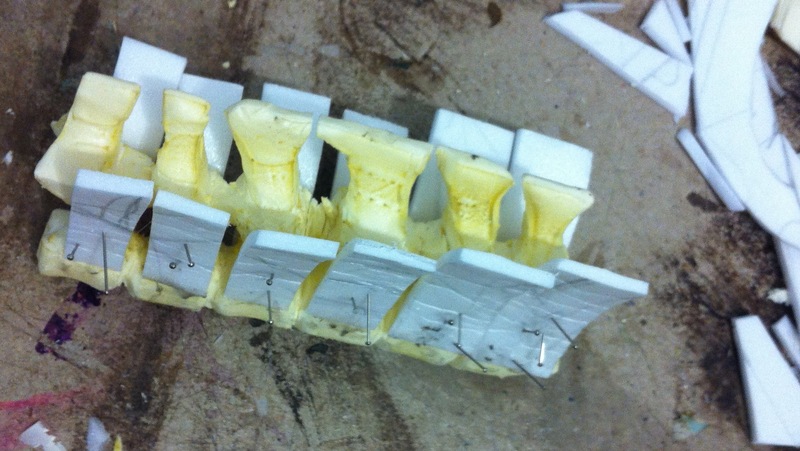 I later added some details with strips of foam, filled in the gaps and shaped with fire. 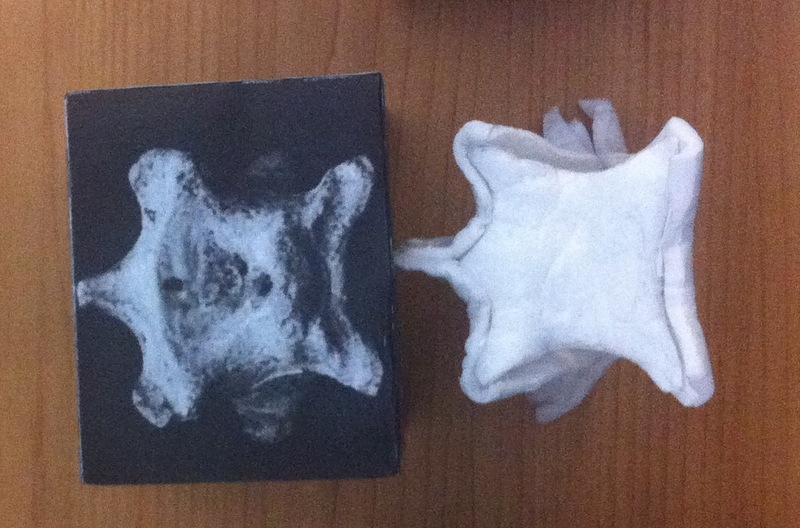 Here they are in dorsal view compared to the sixth cervical vertebra (cervical #5, after atlas/axis). 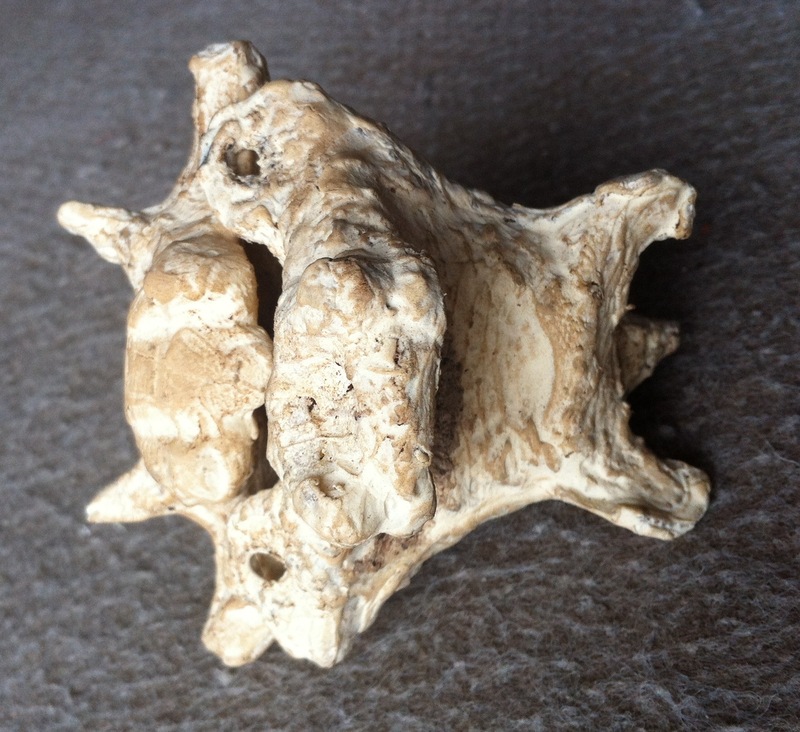 I tried to fit the vertebrae together. Based on how well they connected, I made some adjustments, cut some parts, added some foam. 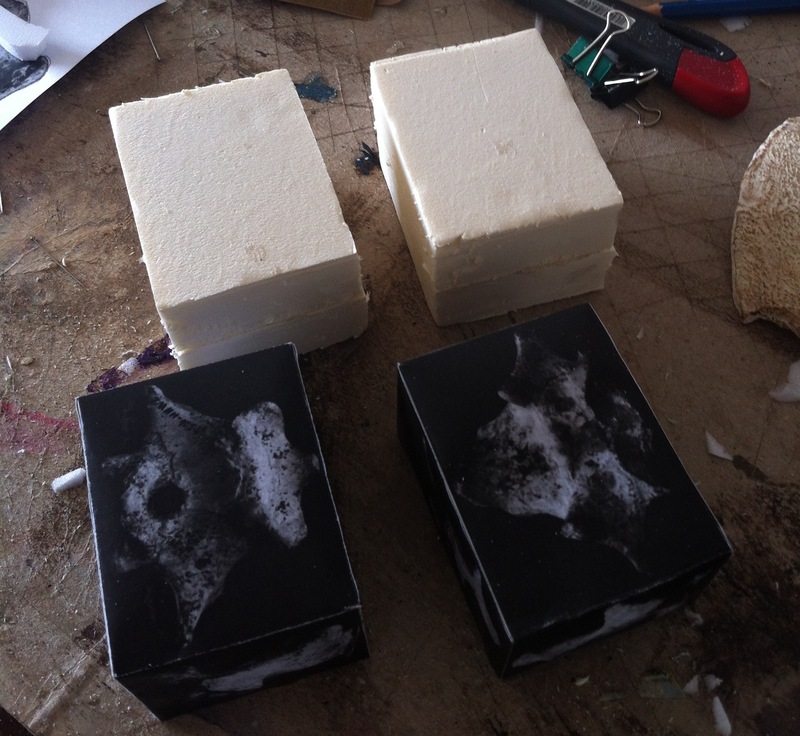 When finished, I covered each one with a layer of acrylic resin (modelling paste) and when dry, stained them with coffee. Here are some pictures of the final result. 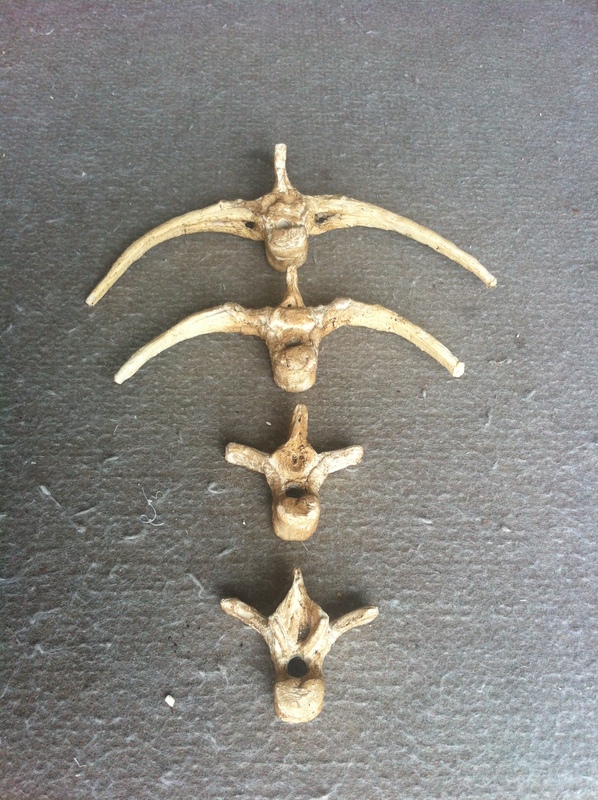 I used six photos of each one of the eight cervical vertebrae as sources, from the same holotype as the skull (stored at the Iwaki Museum in Japan). 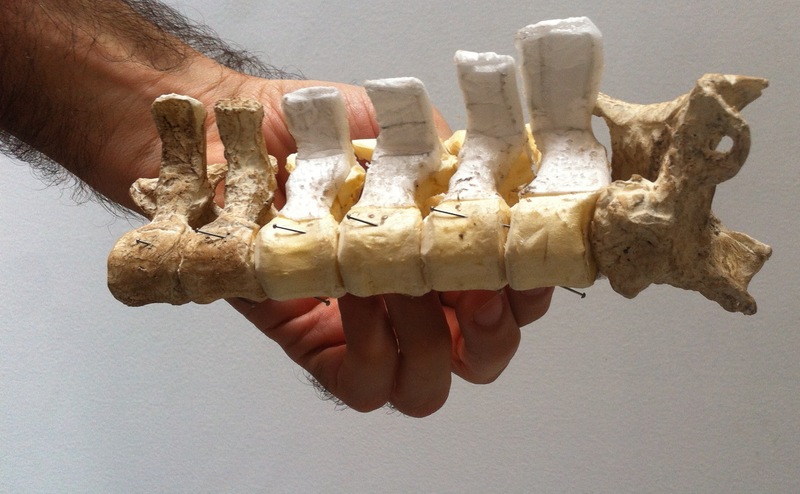 Each photo shows a view from one side of the vertebra. For each group of six photos, I cut out a “cube”, like this. 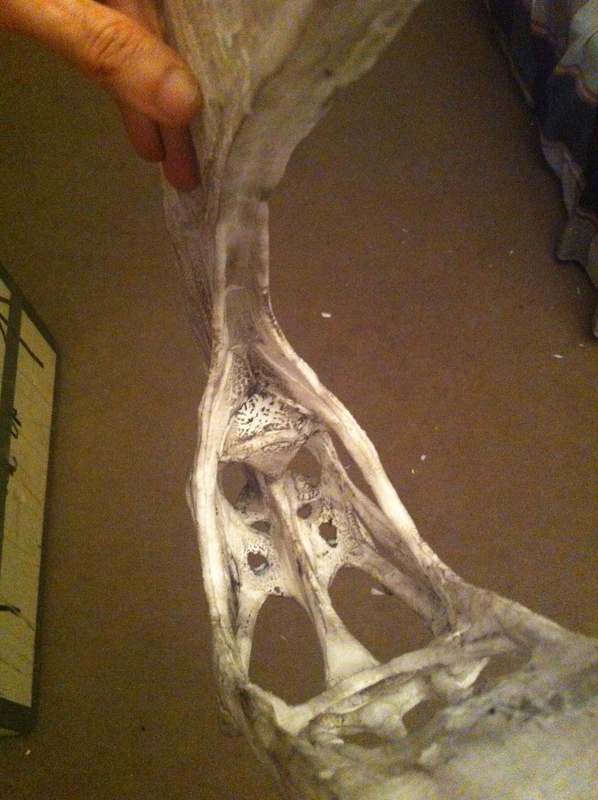 And did the same for all the other cervical vertebrae. 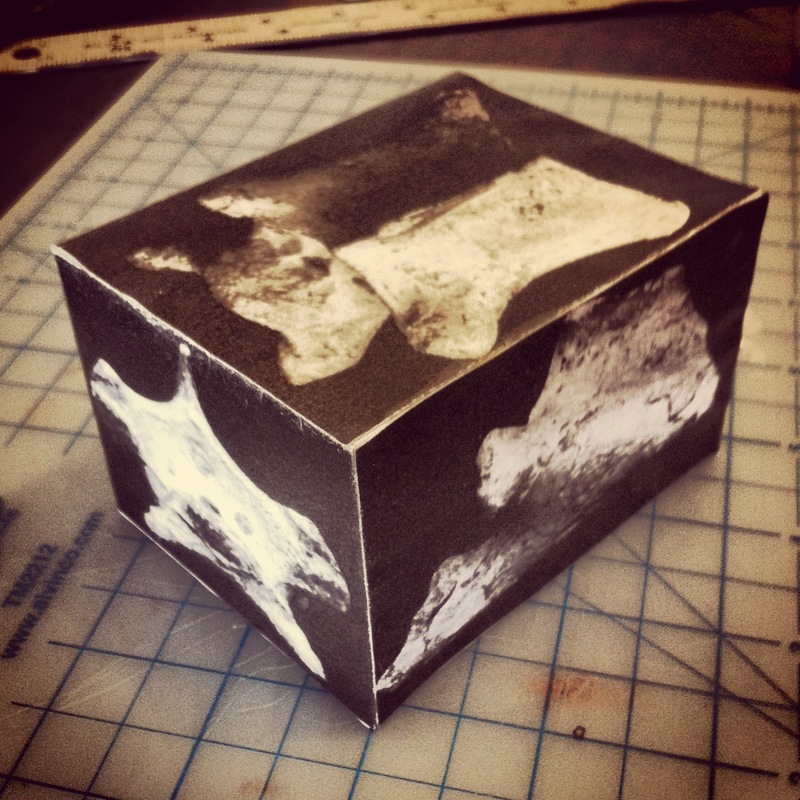 I used the cube as a quick guide to help me fabricate the vertebrae. 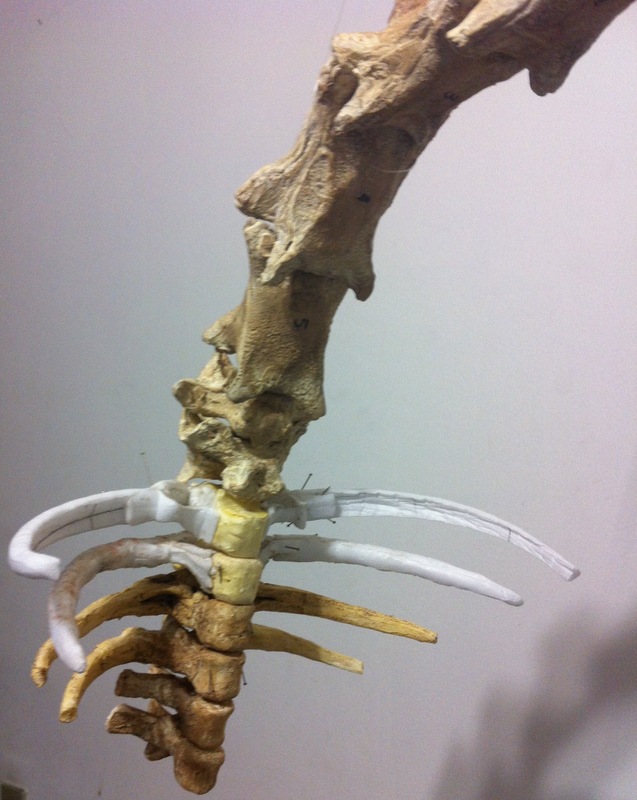 This is a first attempt and I will probably have to redo some vertebrae later, since even with these six views it is still possible to overlook something, lose some detail in the cavities, etc. 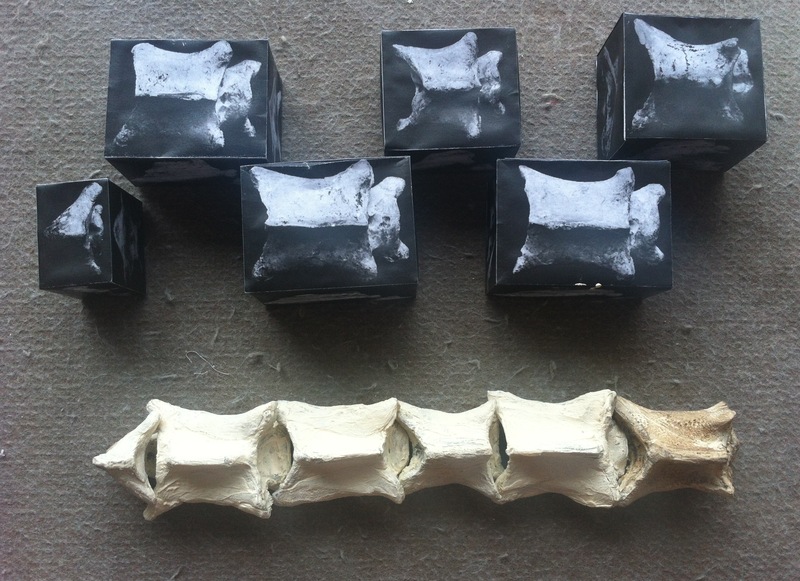 I will only actually finish the vertebrae when they connect properly. 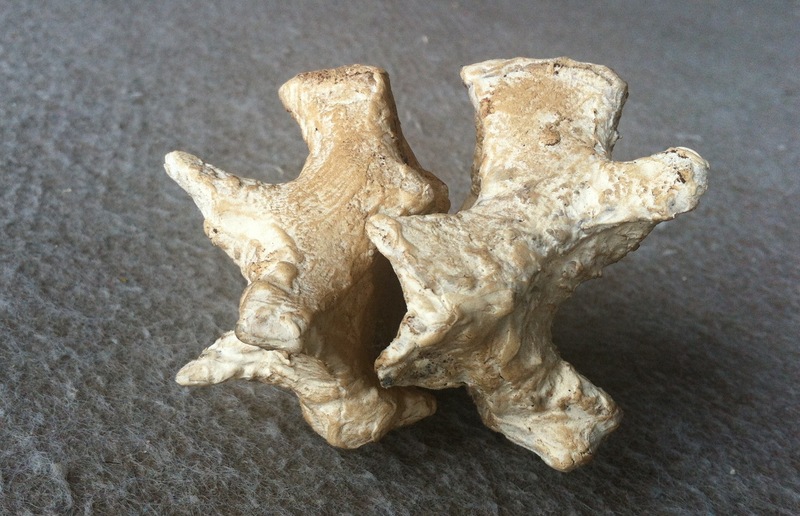 I don’t only expect them to look like vertebrae. I want them to work like vertebrae. Later I will make discs out of silicone rubber and I expect the neck to be able to twist, turn, and to have all the flexibility a neck should have. But at this point I know nothing. I need something to work on, some prototype. 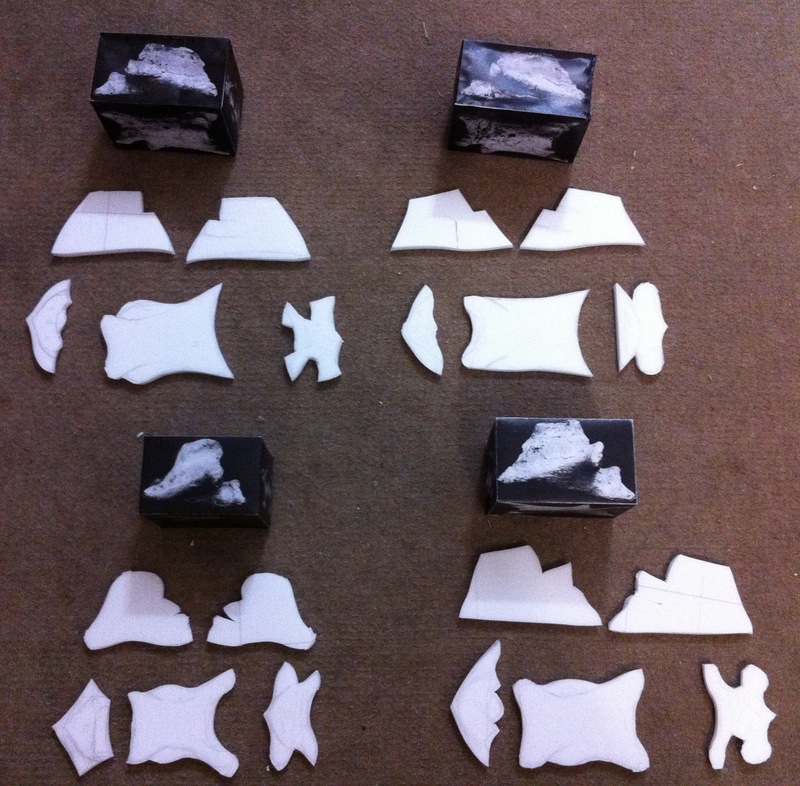 So I start cutting out the sides, the bottom, the front and back parts out of foam. 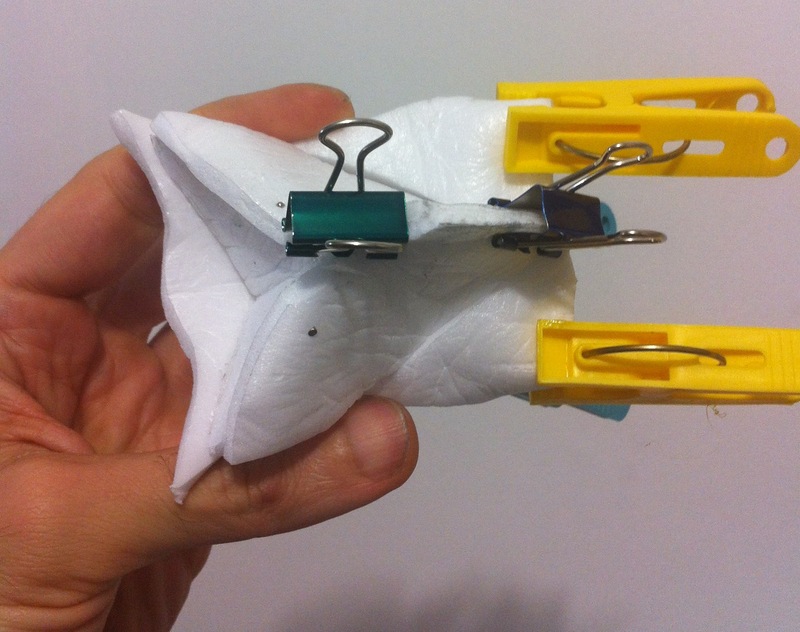 After modelling, some parts may not be necessary, and I might have to add foam, fold, twist, burn. But for now I just cut out the views. The best part to attach are the two sides, since they are almost flat at the top. 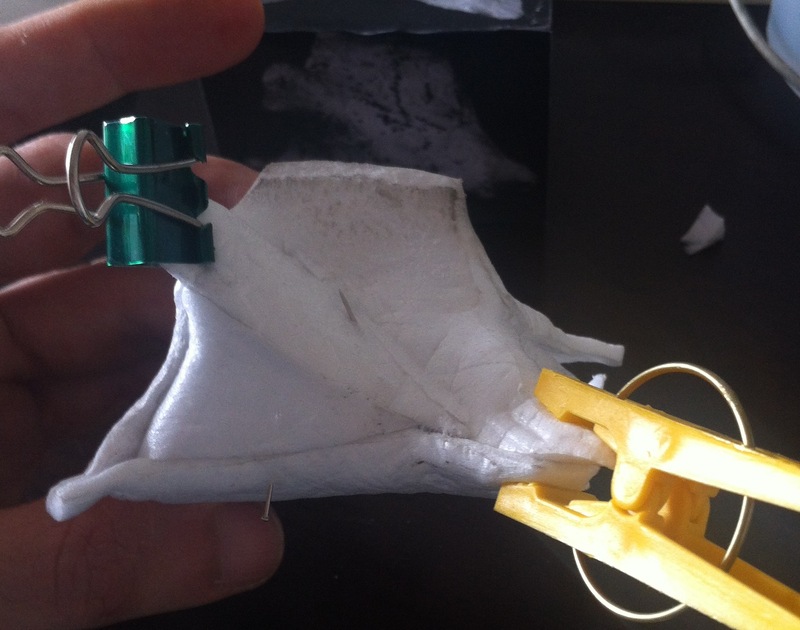 From there, I fold the body of the vertebra, opening its sides until I can attach the bottom or the front/back as support. After folding an cutting there are some places I will need to cover up later. Here it is after attaching these parts. I think this is cervical no. 5 (not counting the Atlas). 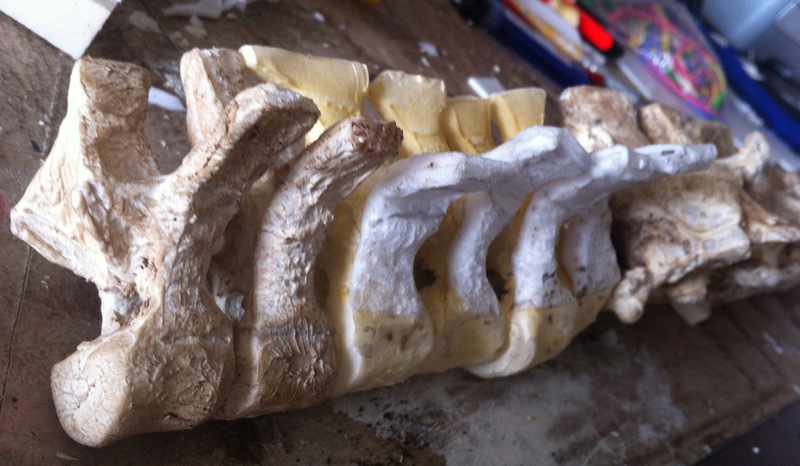 But the side and top views seem OK.
After that I can start closing the vertebra with some foam, add fire to trim the edges, reshape and give texture, cut and twist if necessary. 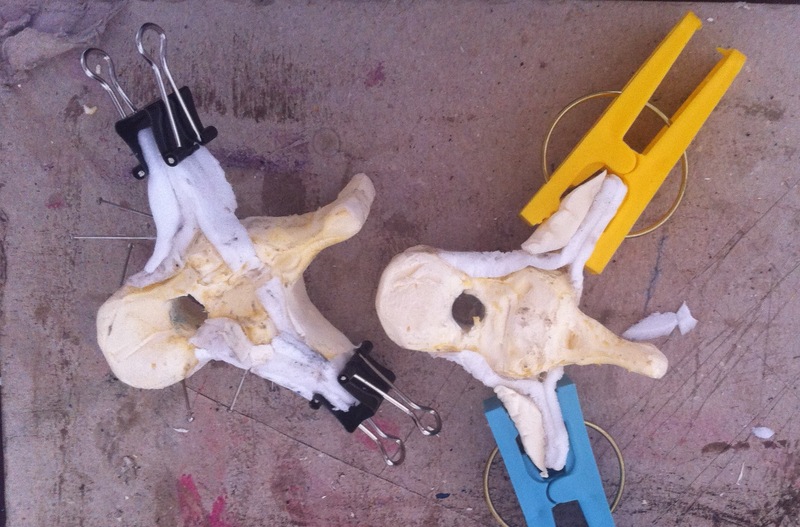 I worked on two vertebrae: the atlas/axis (which connects to the skull) and vertebra number 5 (the last of the long cervical vertebrae). I sanded and stained them before I tested the connections (because of that I might have to redo them later). Here is a view from underneath. 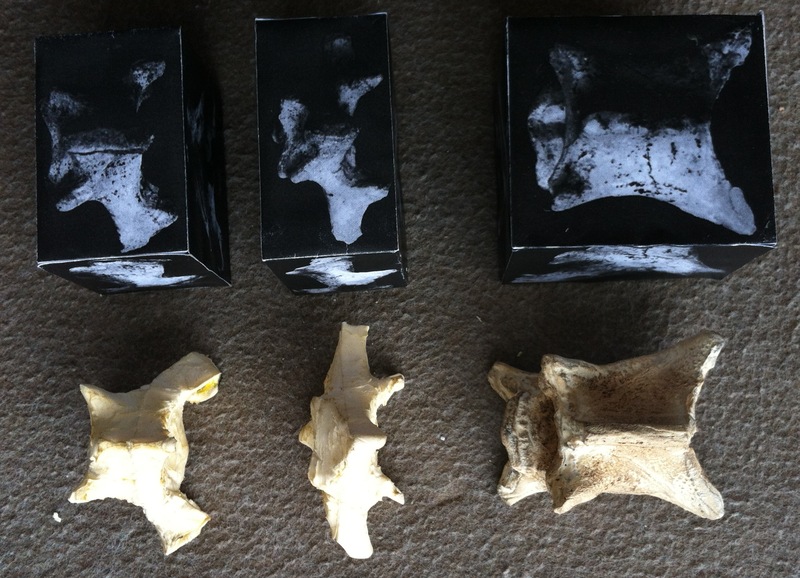 I only stained vertebra 5 so far. Two more shorter cervicals are missing. I might only have time to work on them in two weeks. And there are still many problems. I have to work on the connections. 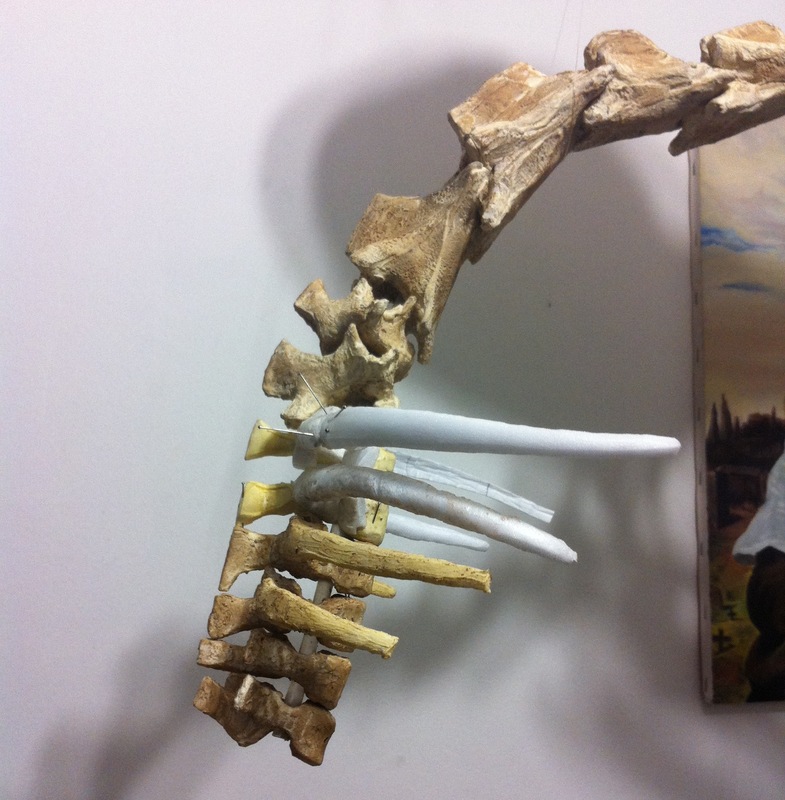 The pterosaur that uses these vertebrae as they are now has a very stiff neck! 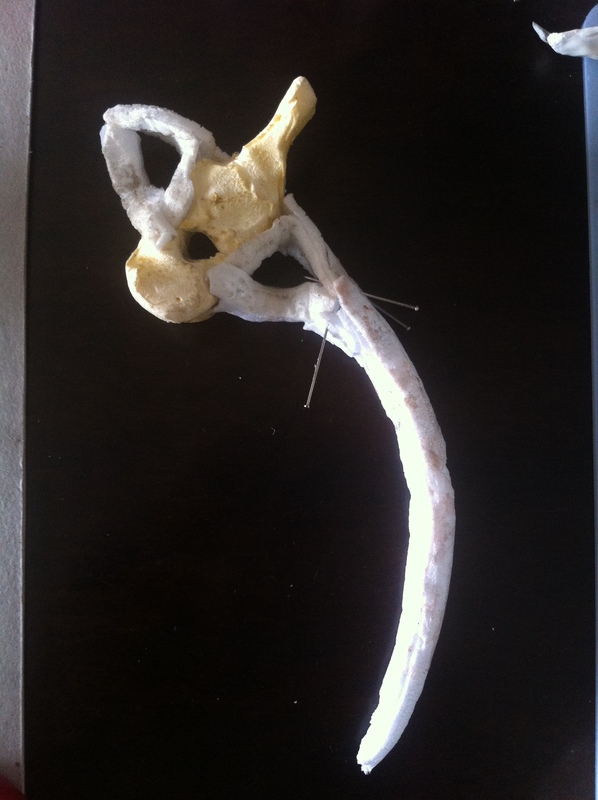 I might have to redo some vertebrae. Now that I can test the connections, I finally have feedback about what I need to change. They aren’t finished, but I tried to connect them to the skull anyway, with the help of some pins and clips. Here is a view from the sides. I will have to stop working on this model for a week or two. 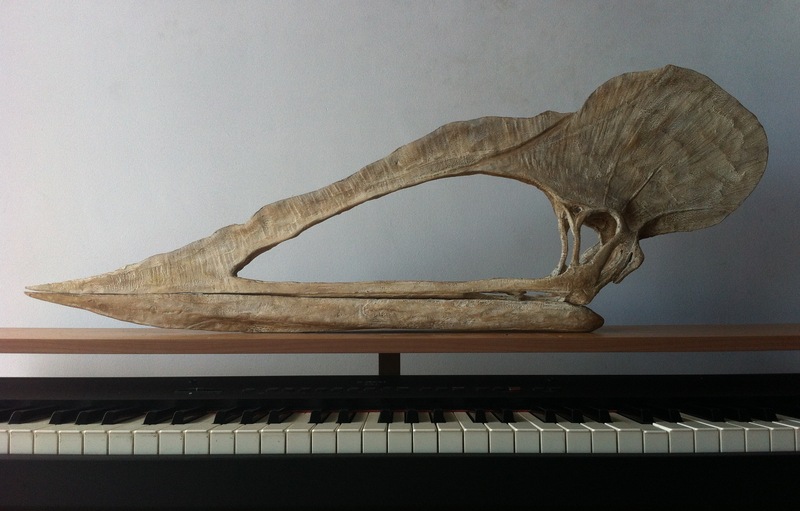 In the meantime, Tupuxuara, now with a neck, will stay floating with the other pterosaur heads. 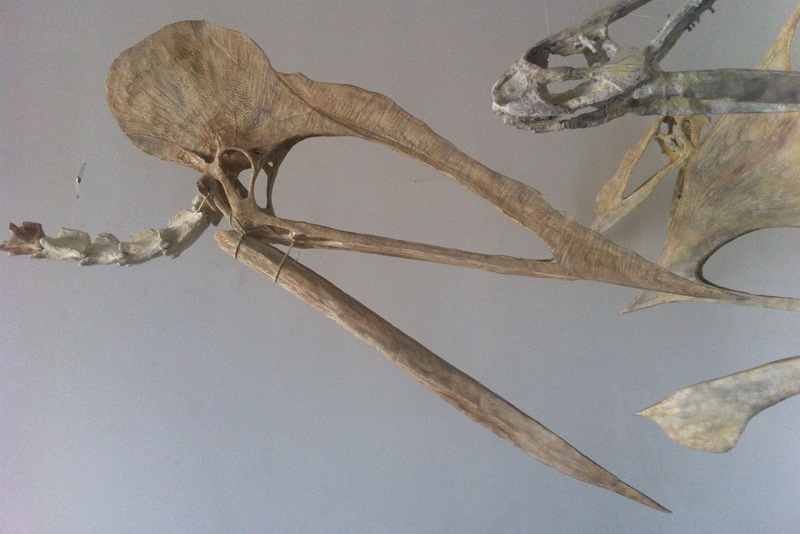 Besides Guidraco, Tupuxuara is the only one of the Imaginary Pterosaurs which has a neck. My last post was about the finished Tupuxuara. 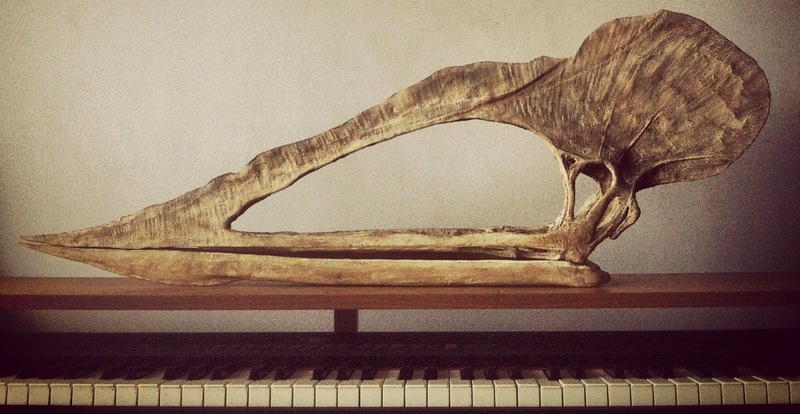 It was finished, since I did my best with what I had: great fossil pictures. 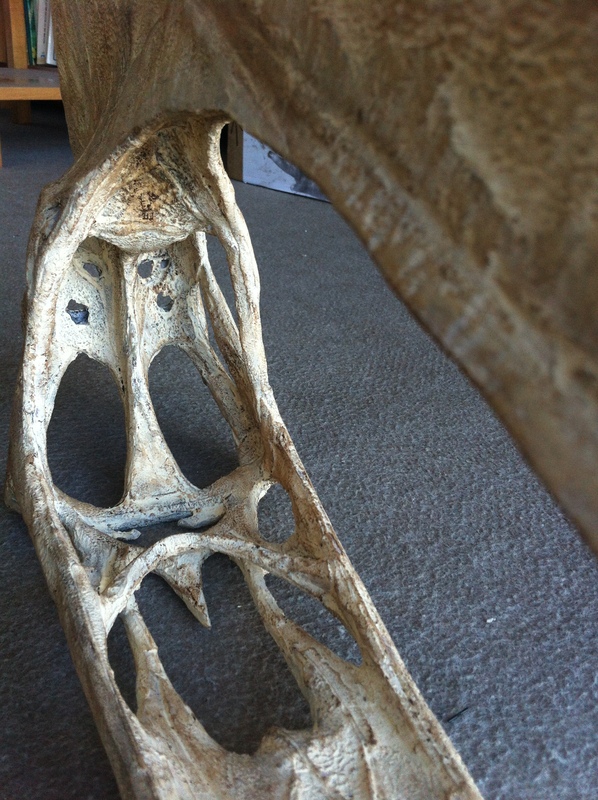 But I only had one side view of the lower jaw. So I was able to make the mandible look like the one in the picture but had to imagine what it would look like from above, below and inside. 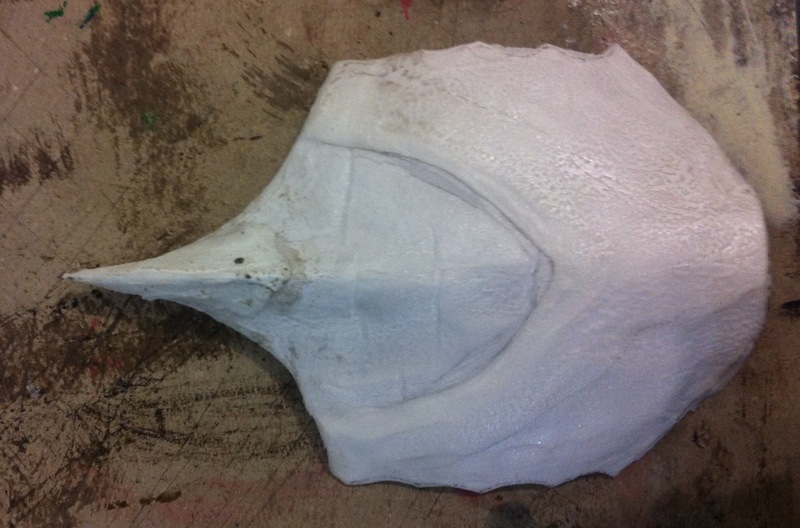 I used the upper jaw and palate as a starting point, but I was wrong. 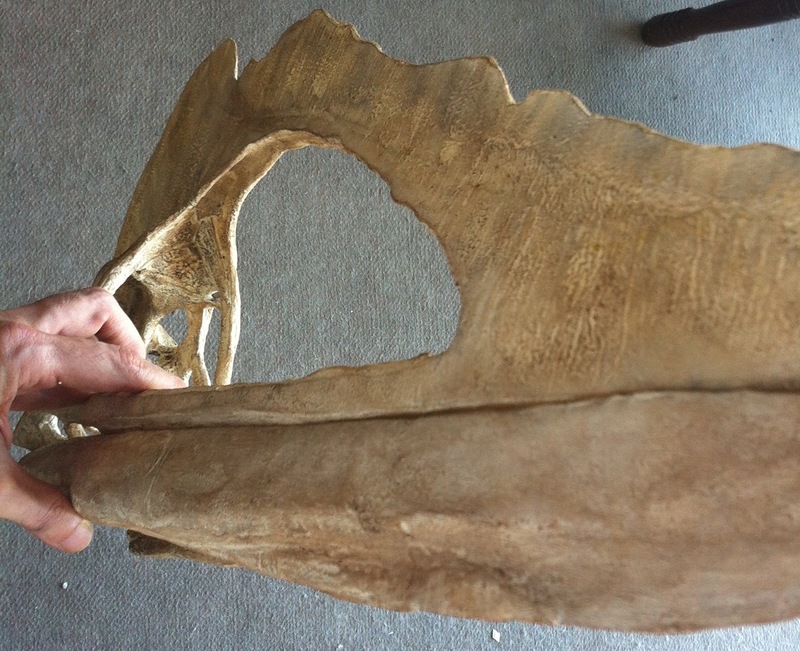 Shortly after I finished the skull I received the photos of the mandible: it doesn’t match the format of the upper jaw as I thought it did. It is wider on the sides and narrower at the back. The sides are almost parallel from the middle to the back. 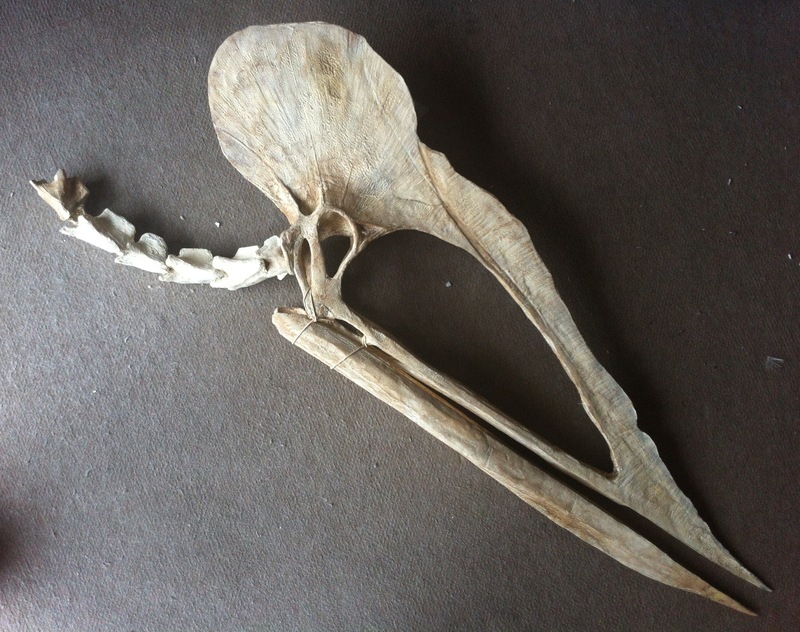 The mandible body is much larger. There are also many other small details I left out. So then I had to decide beween making a new one or fixing the one I have. Since the existing incorrect mandible is already in the correct size, and similar (at least when viewed from the sides) to the correct one, I decided to fix it. I still don’t have authorization to post the pictures of the fossil here to compare the results, but you can see them in my computer screen. So here is the plan. I matched the photos in scale to the previous ones I used before, and drew a guide on paper. 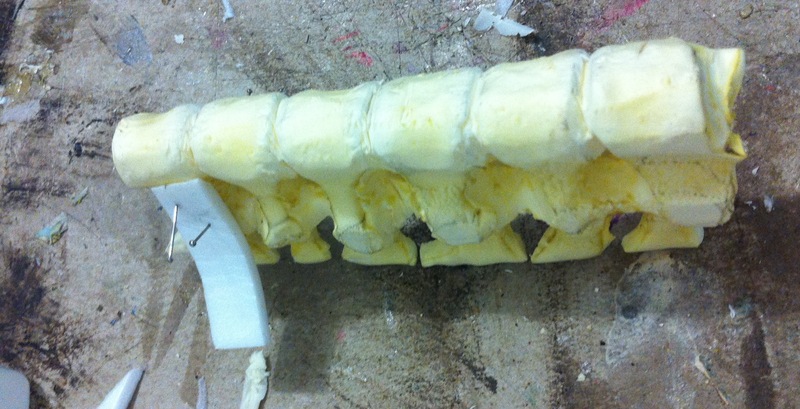 First I glued the tip in place so I could mold the arms of the mandible twisting them slightly outward and downward, shaping it like the picture. 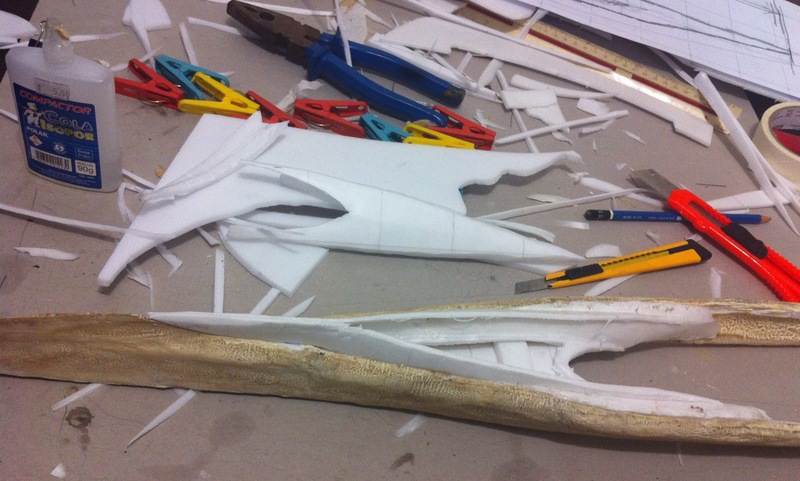 After that, I scraped the acrylic resin to expose the foam and make gluing more efficient. And held everything in place until it was dry. 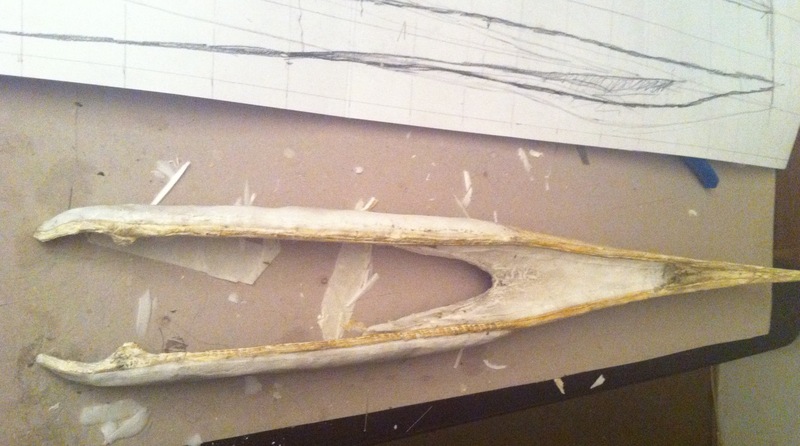 Now the shape of the mandible already resembles the correct one. I reinforced the insides since I was twisting the foam a lot and then I worked on the other side, which has some ridges (which I could see from the side view) and a concave center (which I could not see from the side view). After these changes the mandible had the correct shape, but the sides were no longer vertical but flatly slanted outwards. I added some foam on the top sides of the outer arms of the jaw to compensate this. Then I did some finishing with fire. This is the result. 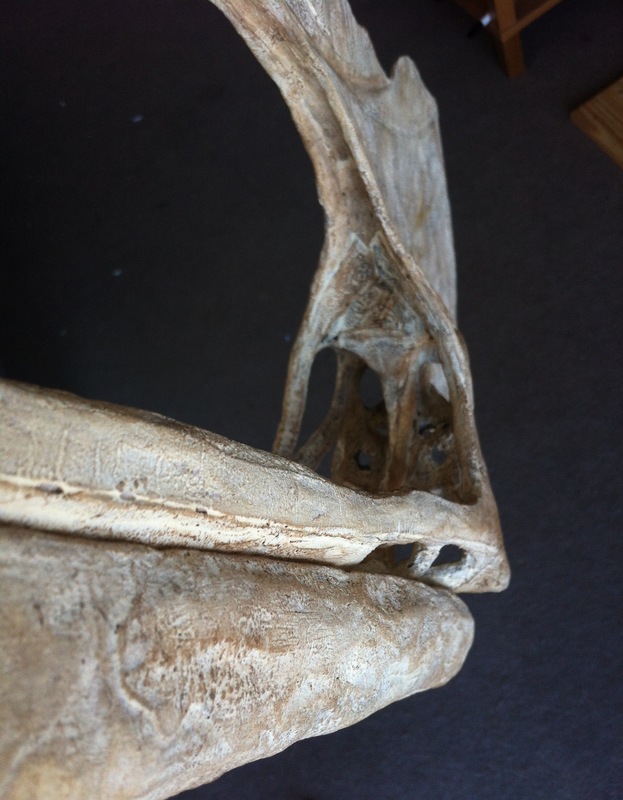 I also had some photos showing the insides of the mandible arms. 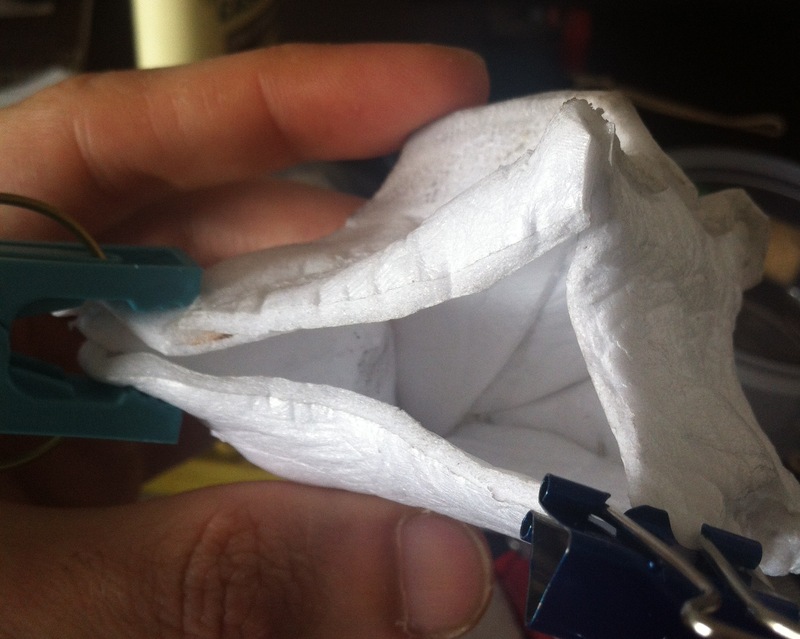 Just one angle though, and not very detailed, but enough to add see two small cavities on either side which I added to my model. 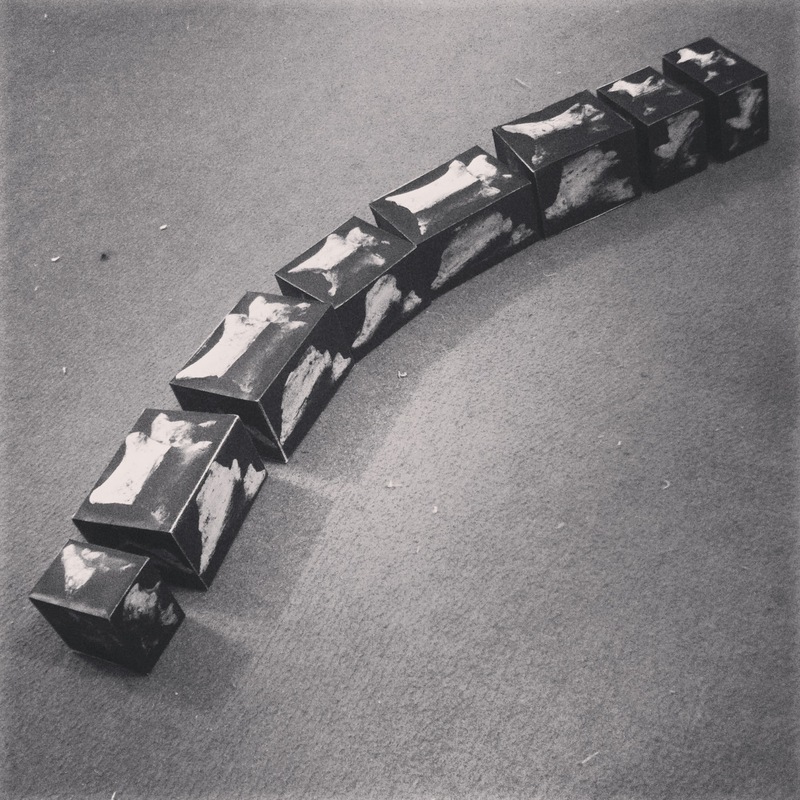 When everything was dry I finished it with fire, covered it with a layer of acrylic resin and let it dry overnight. The next day I stained it with coffee. And that’s it. 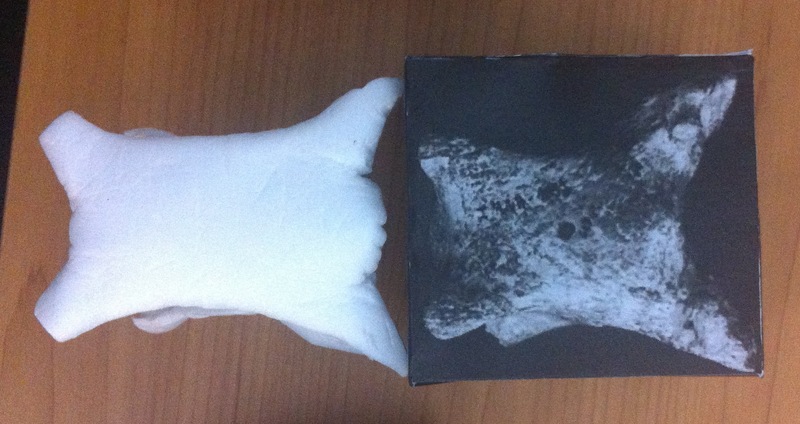 Now Tupuxuara has the right jaw. 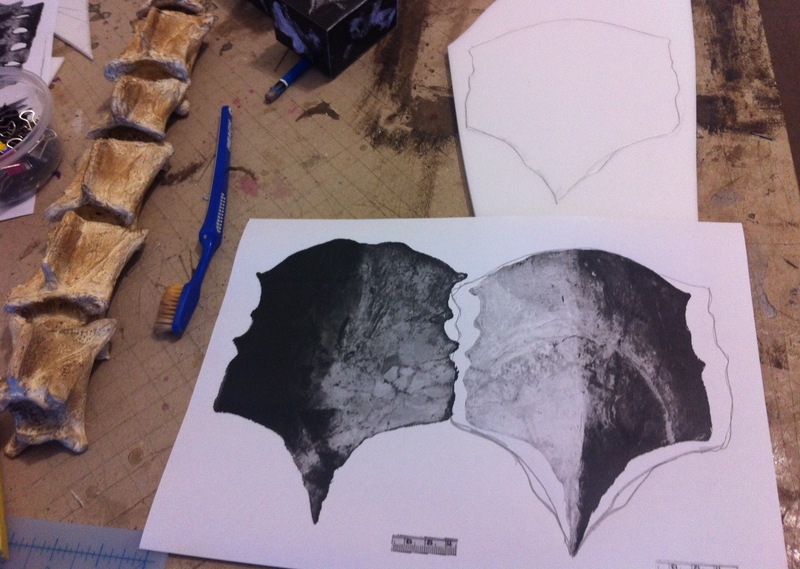 Below are some photos of the finished mandible and of the skull with the mandible attached. And these are the sides. Here are some views in different angles. 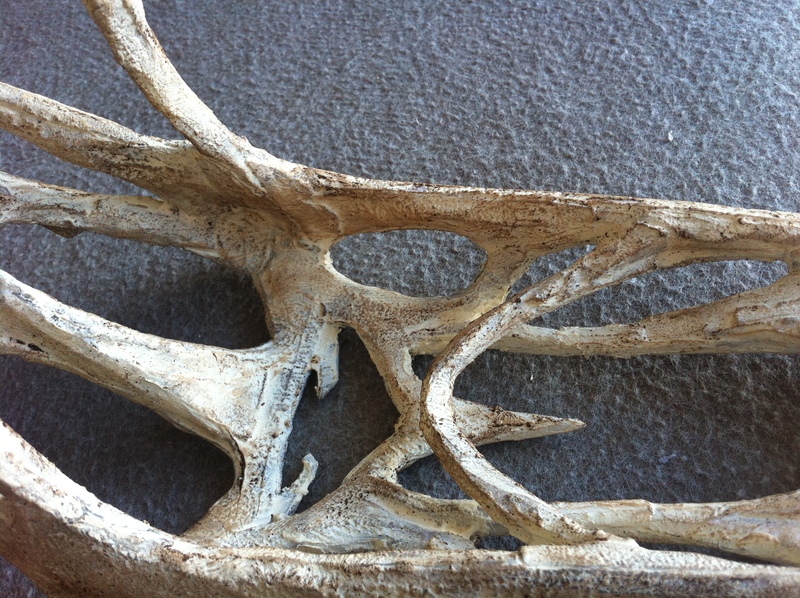 Here are some photos showing the mandible attached to the skull. It’s finished! 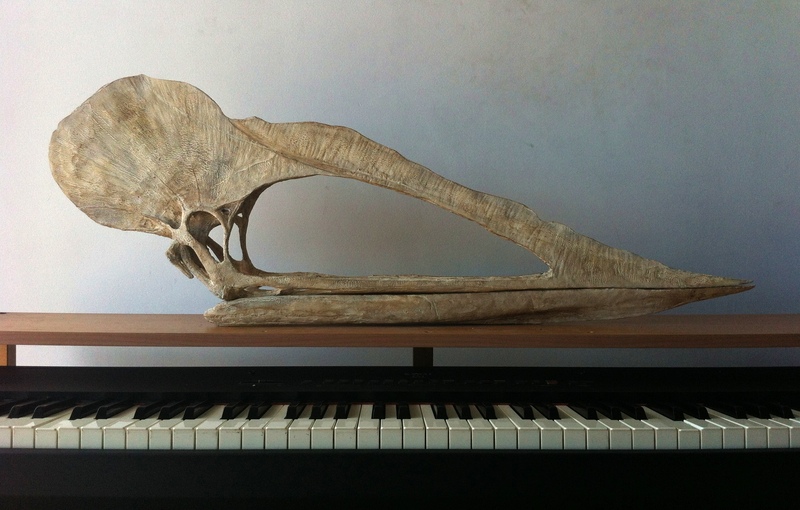 There you have a giant pterosaur head 35 piano keys long. 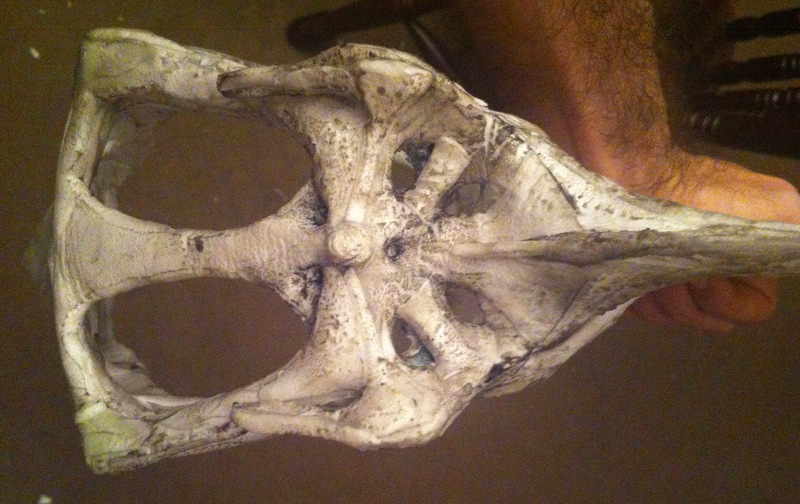 Below is the skull after applying a layer of acrylic resin (modeling paste), and later stained with coffee. I used no paint this time. Only natural stains. 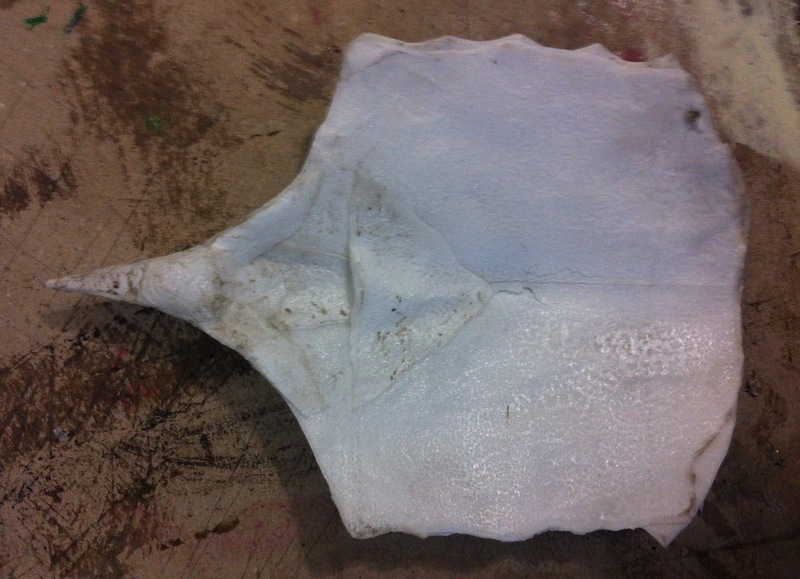 The resin is slightly yellowish, almost white. The coffee gave it a natural color and dark shadows filled the smaller cavities increasing the contrast of the texture. 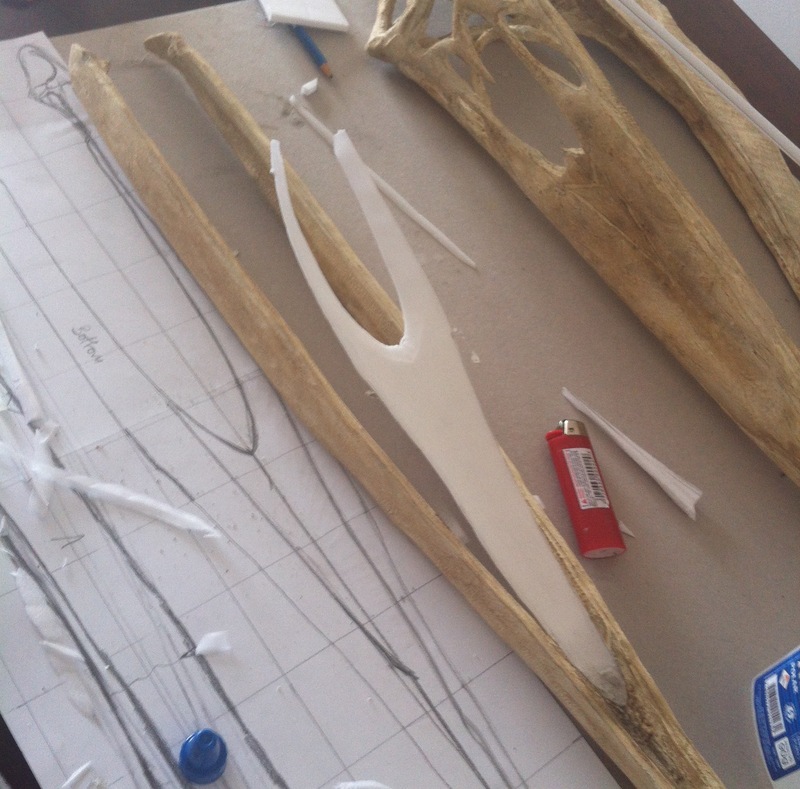 This time I decided to use the least resin and gauze as possible. I used it a lot with the Tupandactylus. As a result, Tupuxuara weighs almost half of Tupandactylus. It is also much thinner and it’s crest is translucid against sunlight. Using less resin also preserved the natural texture of the burned foam, which somewhat resembles the petrified skin, with the veins and arteries that appear in some well preserved Tupuxuara fossils. 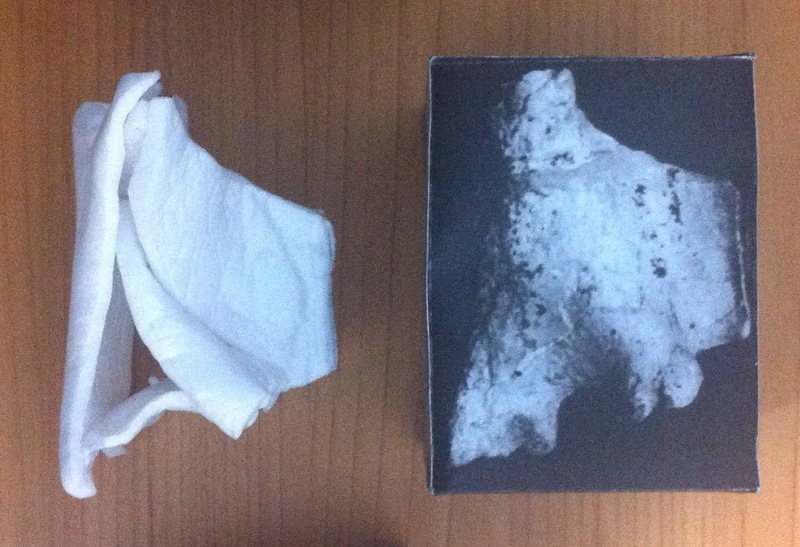 I practically used only one image source: photos of the fossil preserved at the Iwaki Museum in Japan. Unfortunately I don’t have permission to post them here. It would be interesting to compare the results. 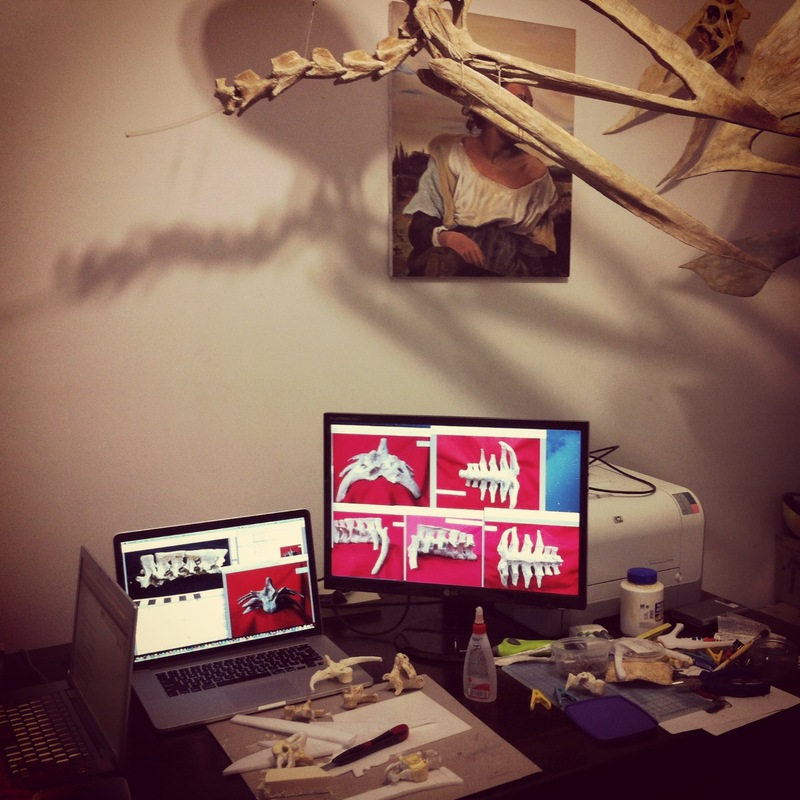 For the mandible, which I didn’t have enough information, I compared photos of a Tupuxuara replicas and fossils available from Google image searches. From this article: Pinheiro & Schultz 2012, I obtained additional information about the palate. This mandible is incorrect. The closed area should be bigger and the shape is different. 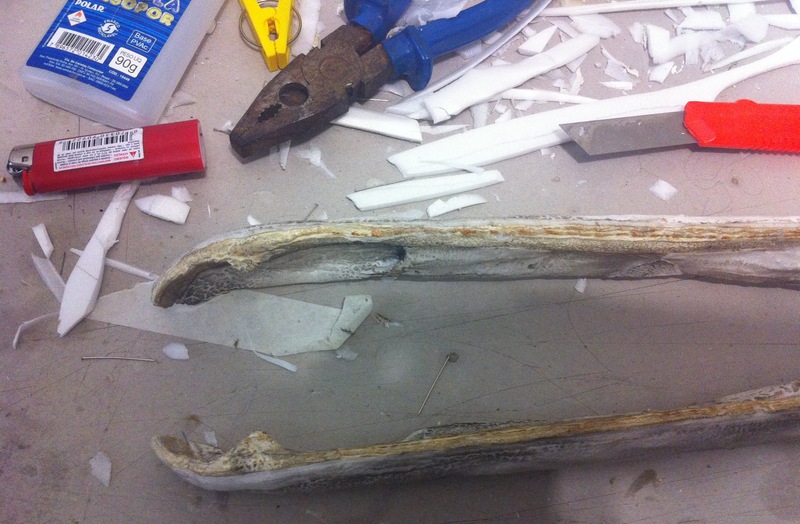 I had already suspected the sides (mandible ramus) were proportionally too long (considering other pterosaurs), and as soon as I started to write this post I finally received some photos of the actual mandible in many different angles. 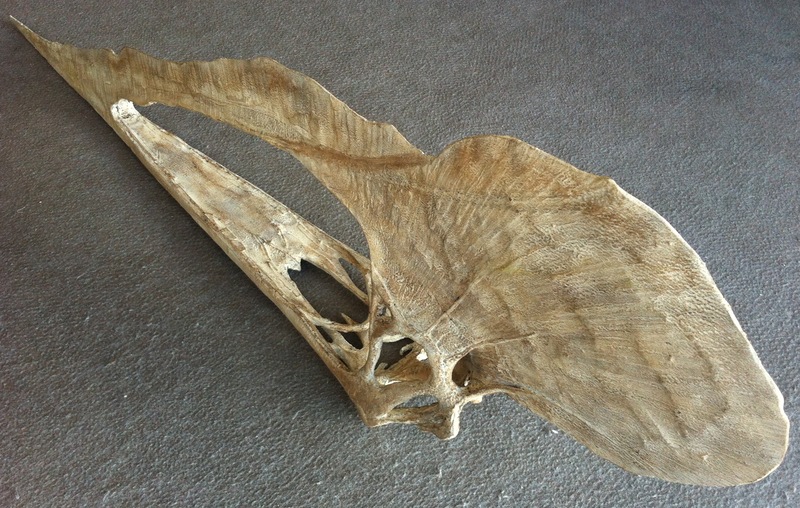 It is different: the closed area (mandible body) is some 10-12 cm longer and it has a different shape. This week I will discover how I can fix it. UPDATE: I fixed the mandible. There is a new post about it. 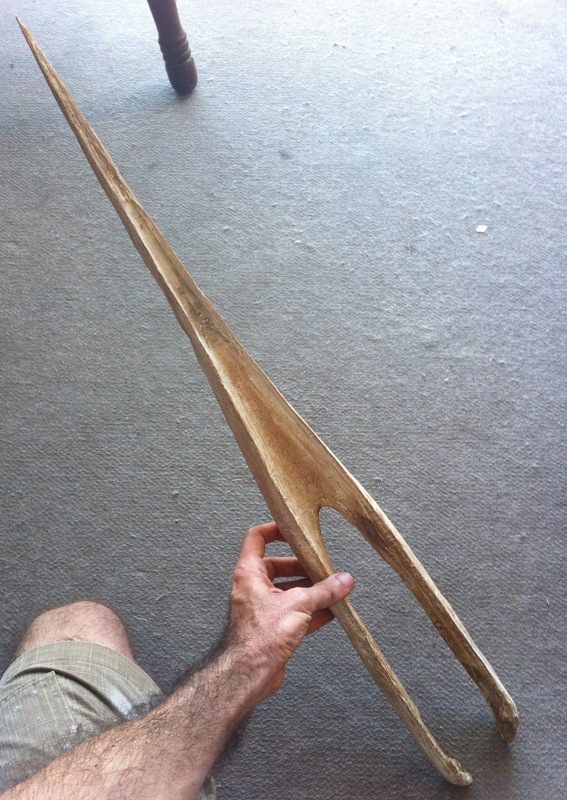 This is the imaginary part of this Tupuxuara model. 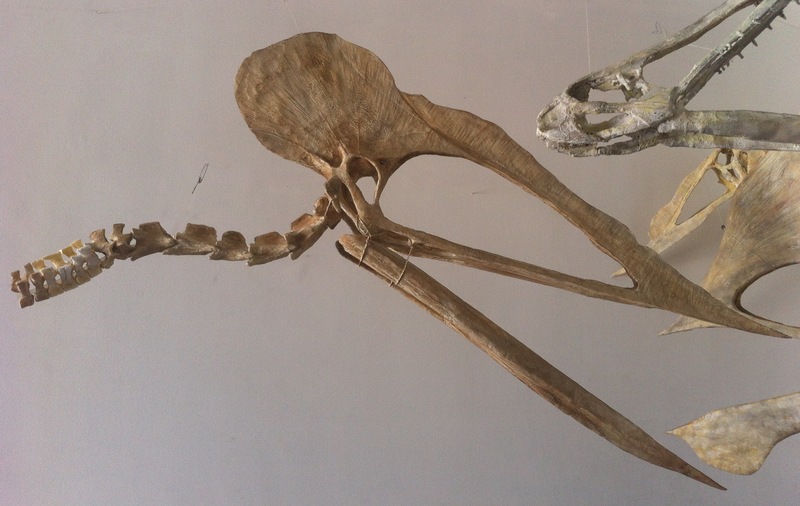 I didn’t find any fossil pictures that showed the details inside the skull, so I inferred it from the external structures, bird skulls, other pterosaurs and some imagination. The palate was always an almost imaginary part in all my previous models. This is the first time I use fossil data to model it from. 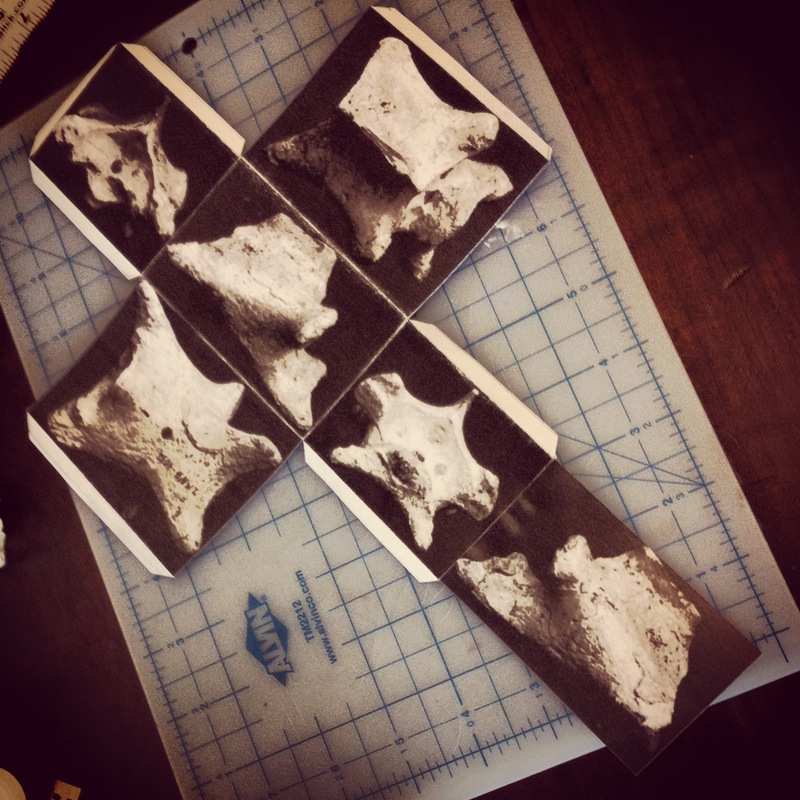 The photographs were very detailed and I did some additional research to infer how to place the bones in space. 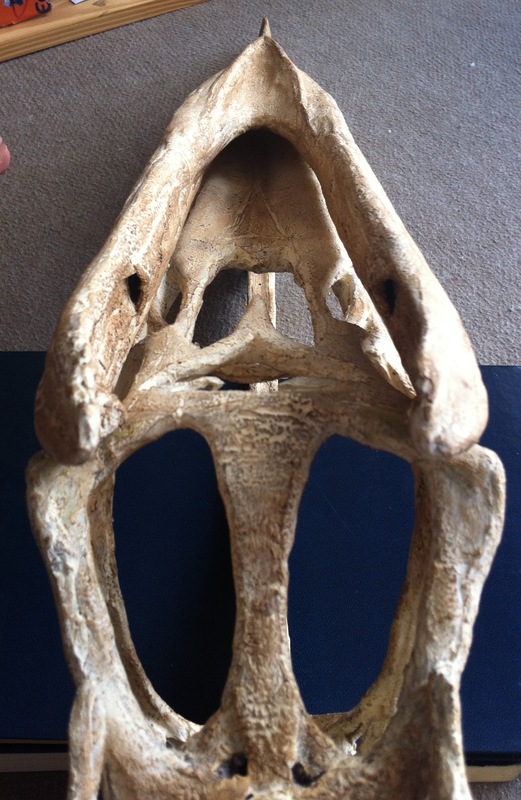 This is a view from the bottom of the skull, showing the palate. 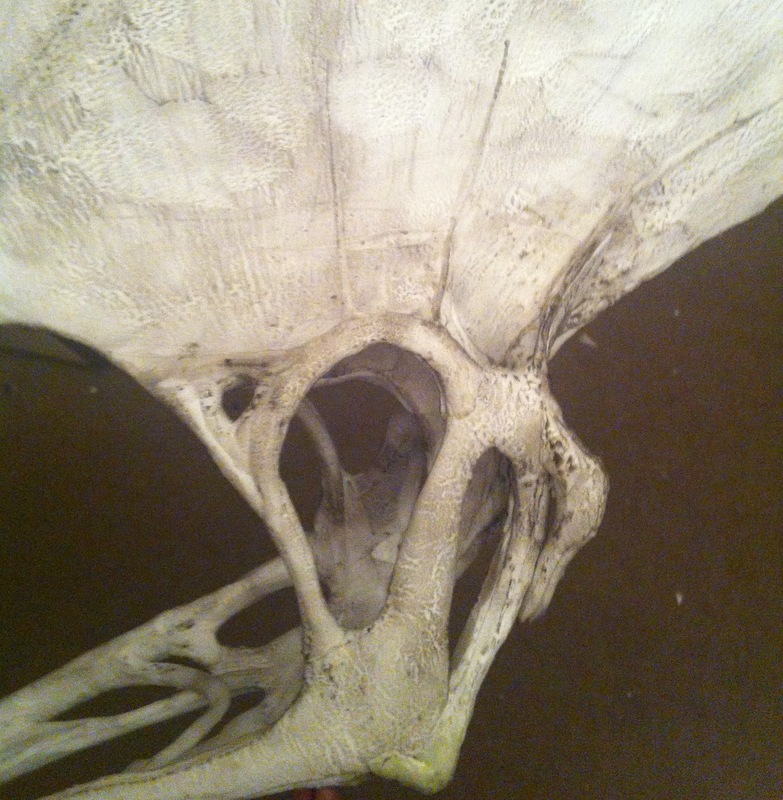 Here is a close-up of the rear palate showing layers of palate bones. 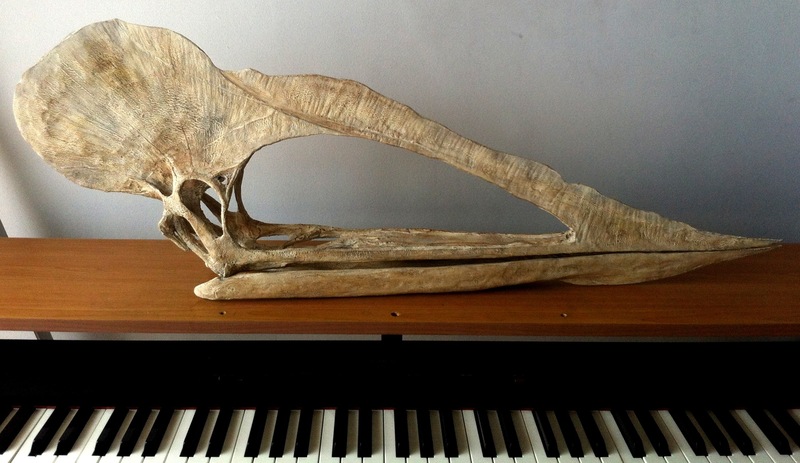 Like the palate, there are few pictures of pterosaur skulls that show the back of the head. 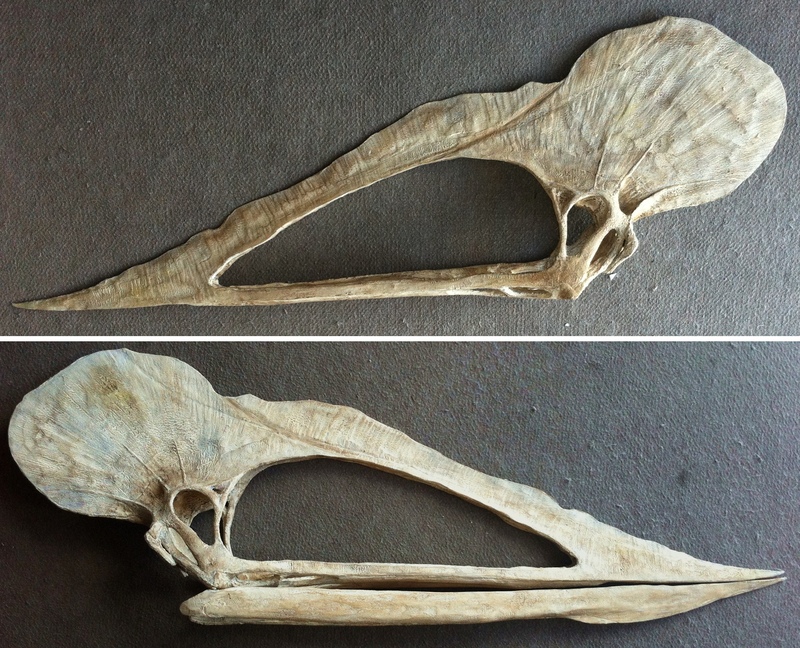 Since I had photos in good resolution I tried to make it as detailed as possible; It wasn’t as easy as the palate though: the head was not completely hollowed out and it wasn’t photographed in many angles, which made it harder to discover the three-dimensional shape of the bones (I rely on shadows and reflections). 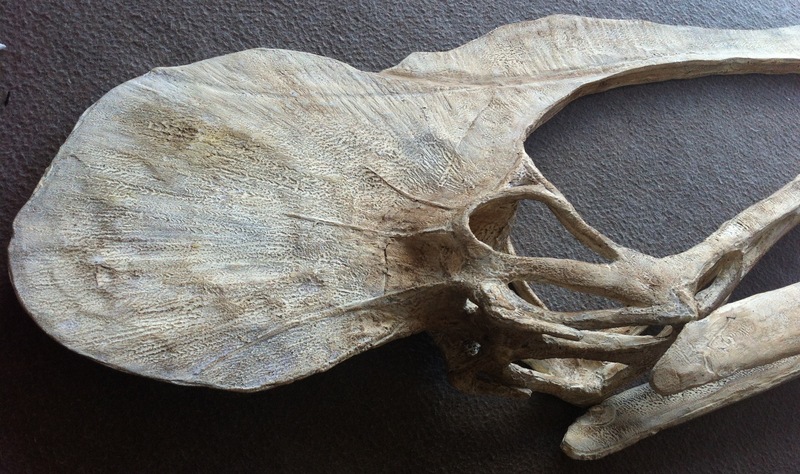 Here is the skull with the mandible attached and open. 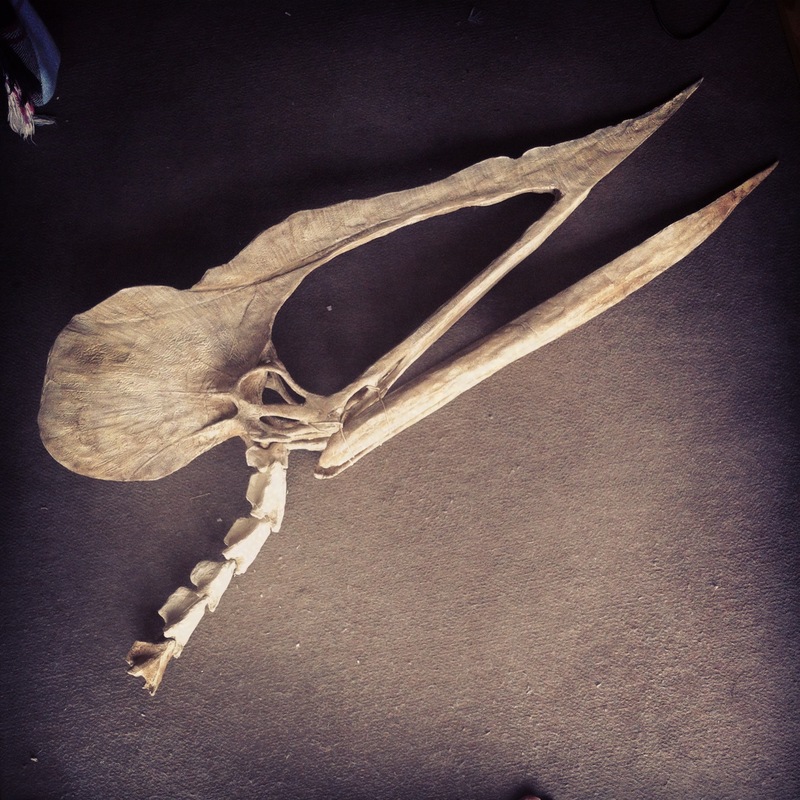 I could consider the skull finished. 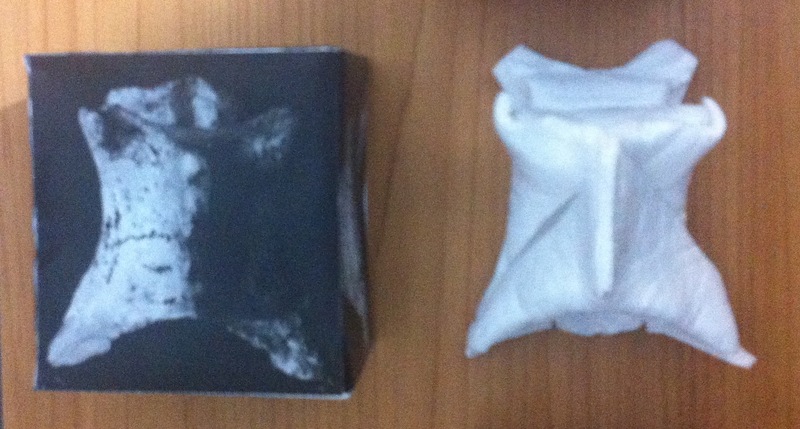 It’s light (about 100 grams) and it took me less than two full days. That makes it the cheapest of the five pterosaurs so far. 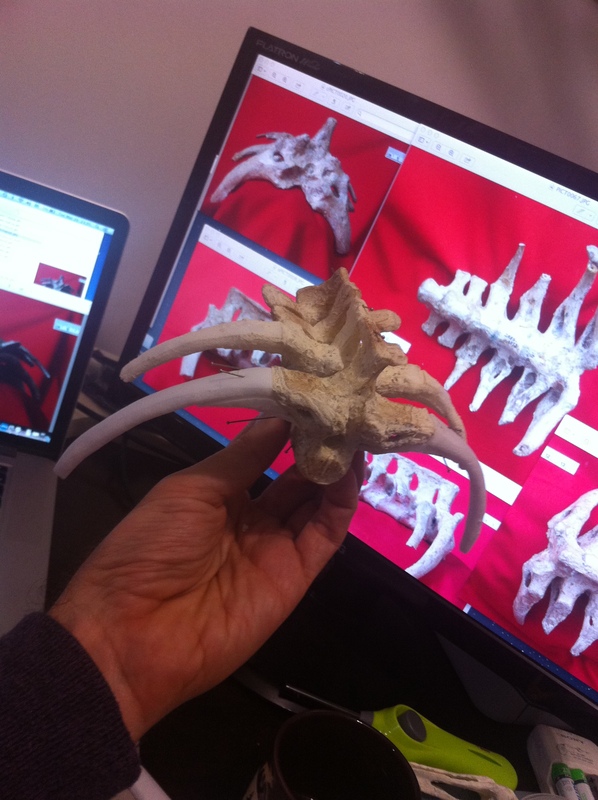 But this time I have very good fossil images so I will invest time into making it as detailed as possible. 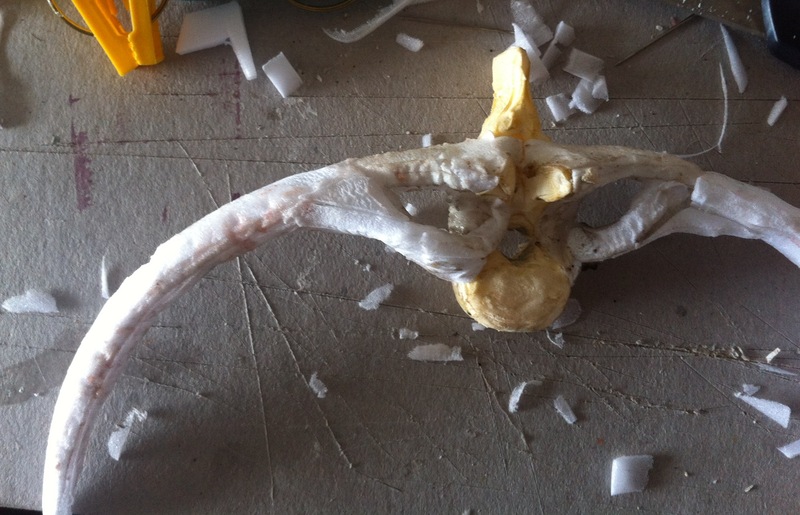 Today I worked on improving the structure of the skull, filling gaps, giving volume to flat layers, molding and shaping. I also worked on the texture of the crest to make it look a bit like veins. 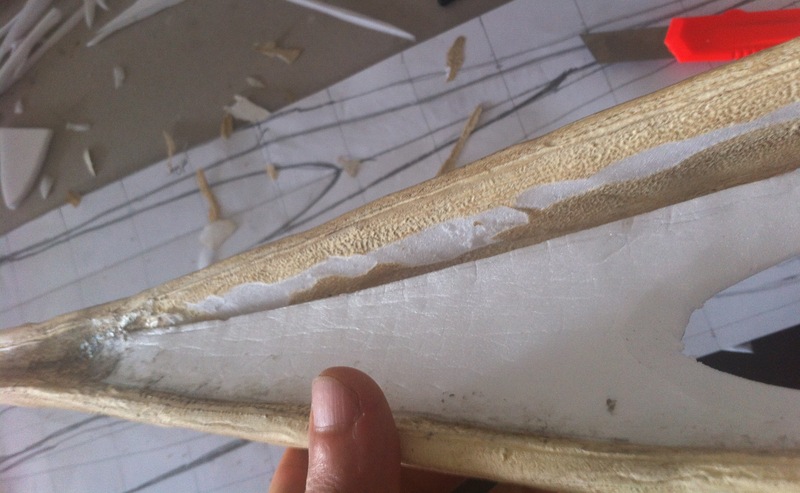 I marked inset lines by pressing the foam and formed outset lines by pasting some thin strips of foam along the crest. Then I slightly melted the foam with a lighter, letting it burn away some of the width of the crest while giving it a realistic look. 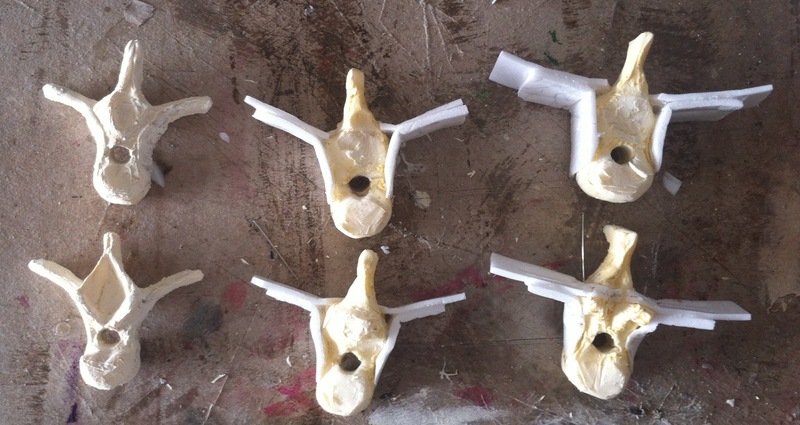 I also pasted extra foam to the edges of orbits and lacrimal cavities so I could mold them better. 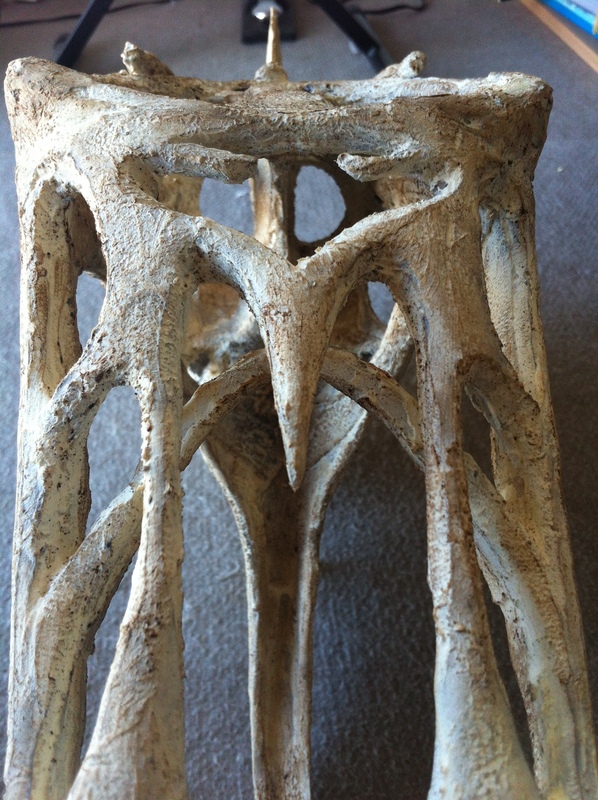 This is the a side view of the skull. 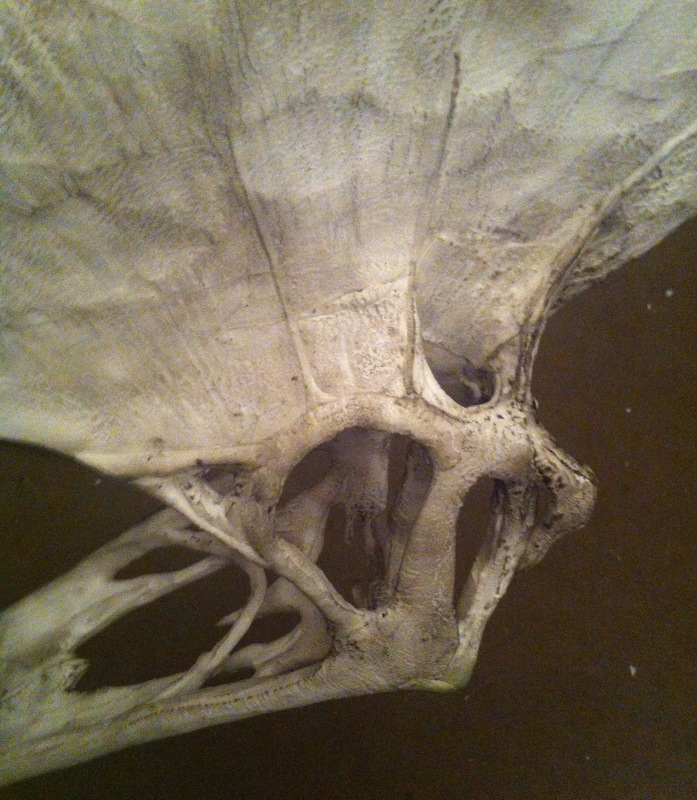 You can see the mandible joint has a different colour. That’s because I coated it with epoxi resin (it needs to have a stronger surface in order to offer stable support to the mandible). 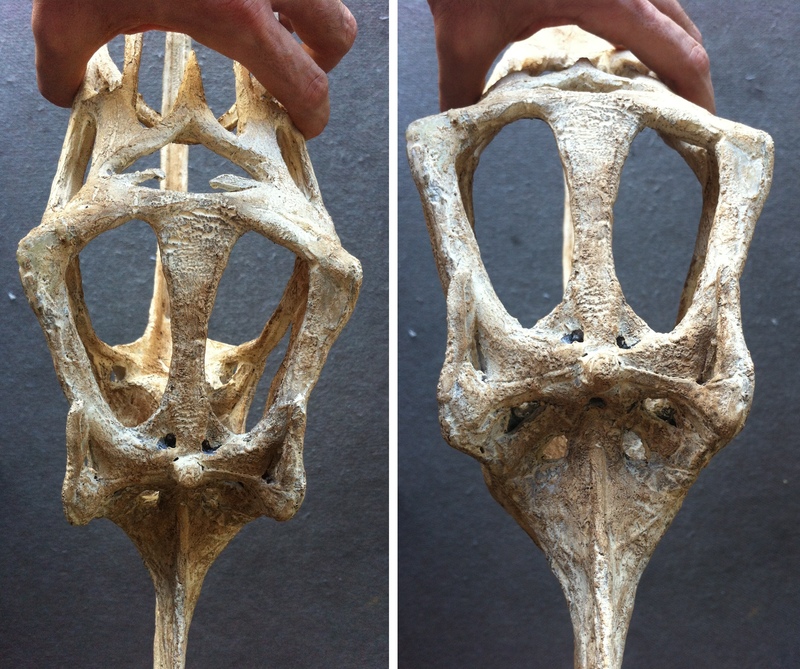 This is the other side of the skull showing the temporal aperture. 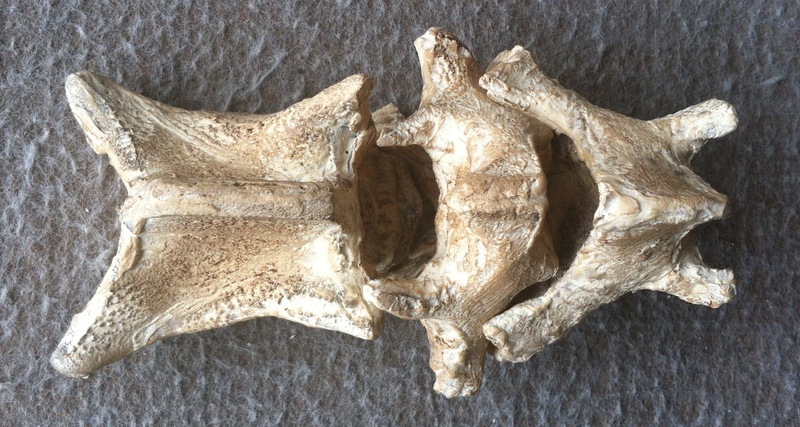 There is still a lot of work to be done in the back of the head (occipital bone). 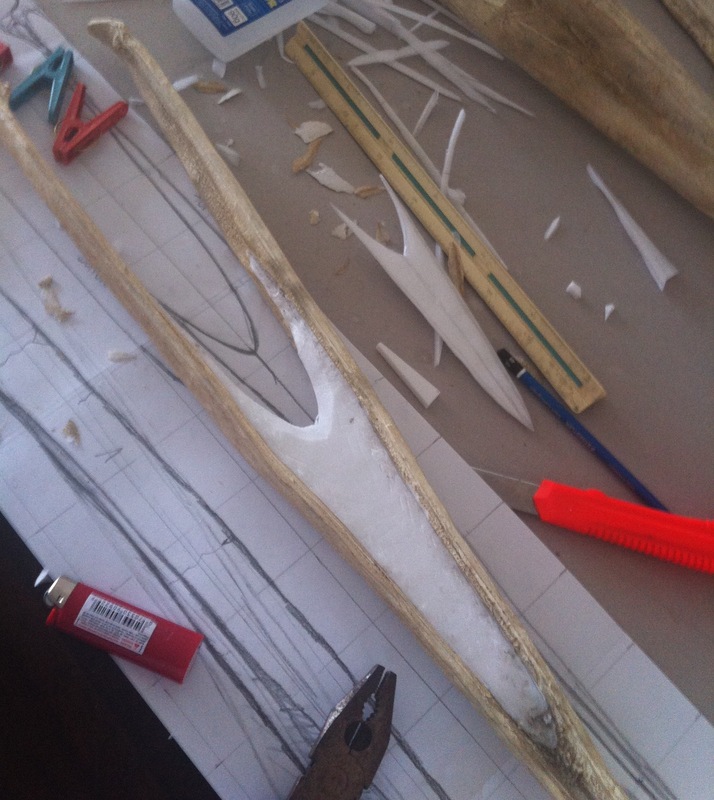 I started adding some strips of foam to model bones and cavities according to the fossil images. Then I added a bunch of minor details by pressing, cutting, burning. 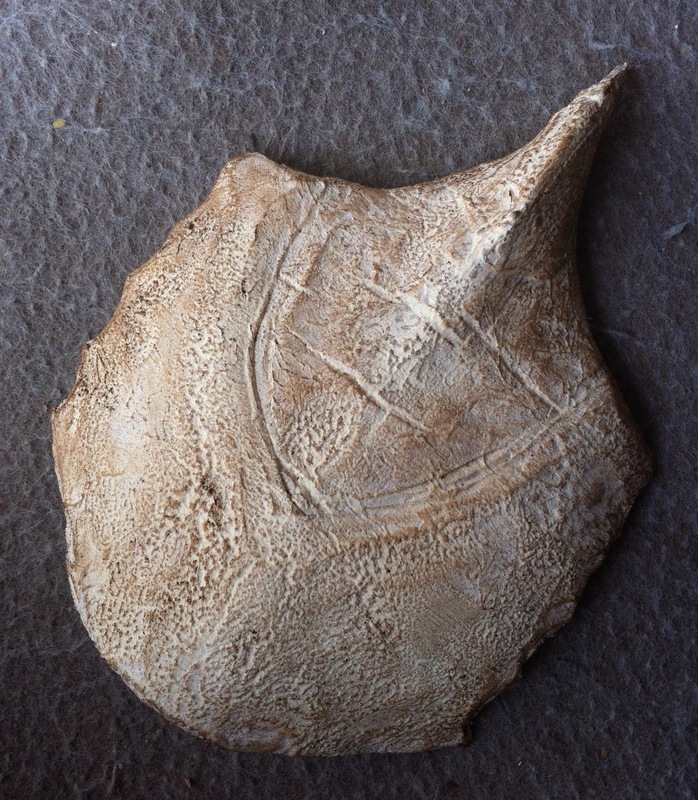 I tried to shape it so it resembles the fossil image as much as possible. Of course there are many limitations. My sources are still just photos. I don’t have access to any 3D models (not even digital ones). That means I may be deceived by some stain that looks like a shadow or miss the information given by some shadow that I overlook as a stain. 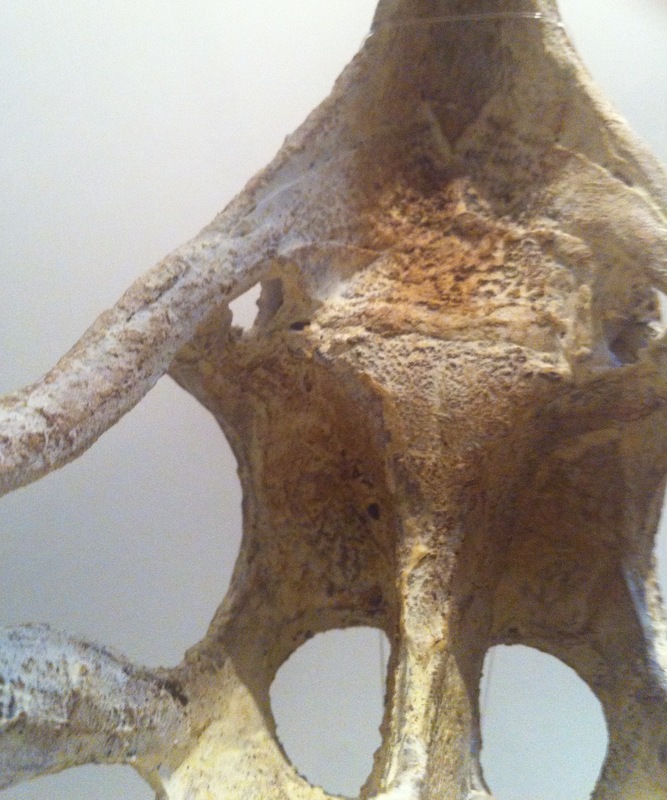 I have two photos of the occipital area in two very similar angles. The lighting is reasonable, but could be better. This is what it looks like on the inside. I have no photos of the head from the inside, so I based my speculation on the effect the outer structure (which I know from photos) would cause on the inside and from what I infer from other animals: round concave cases for the eyeballs, for example. 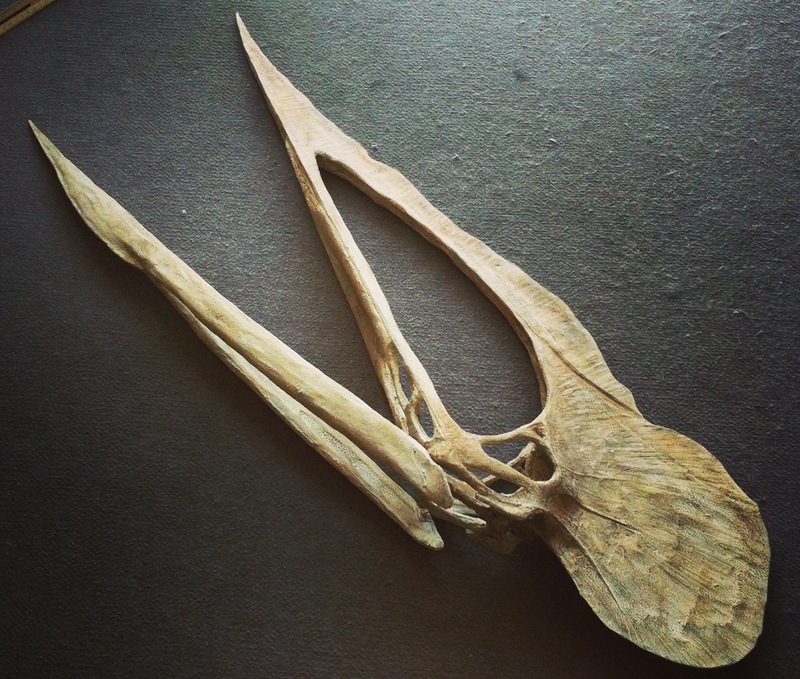 This is the imaginary part of this pterosaur. So here are some photos os the Tupuxuara so far. 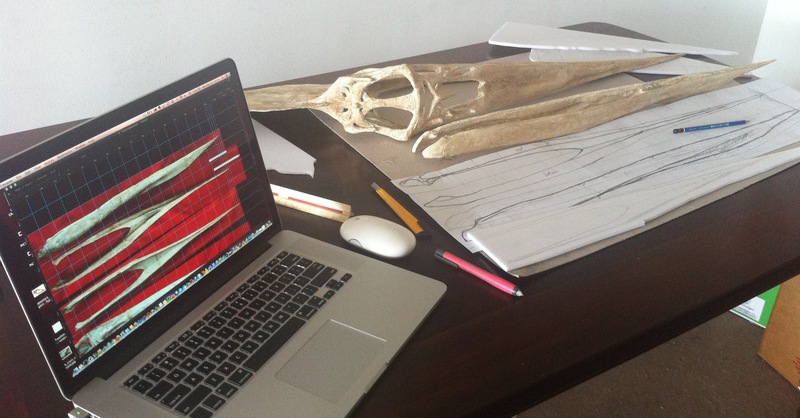 Except for the mandible and the details inside the skull, all the rest is based on photographs of an actual fossil. 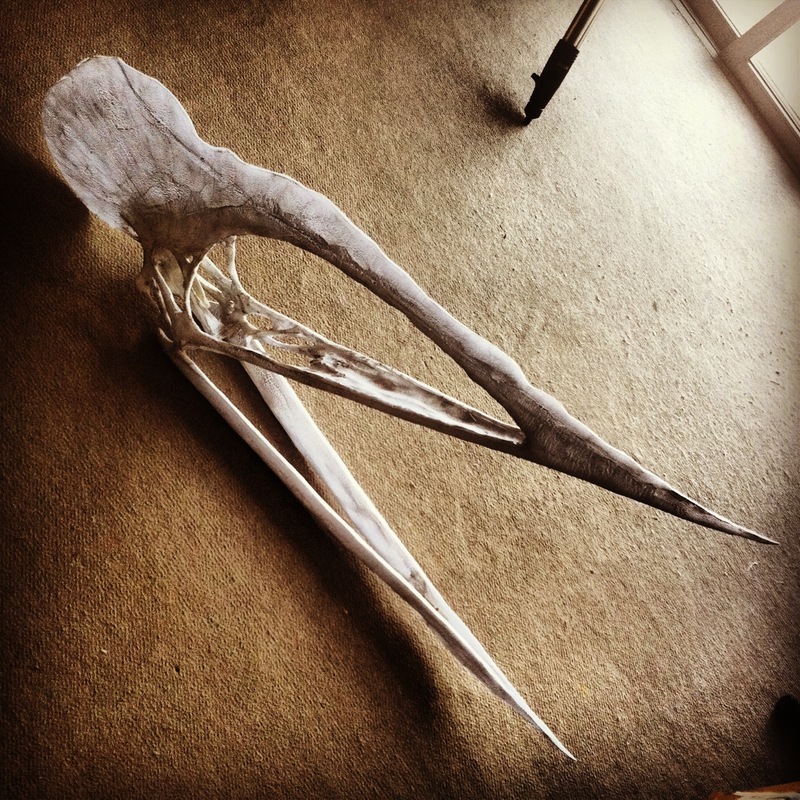 Tomorrow I will finish it with a coating of acrylic resin, sand it a bit and add some stains.